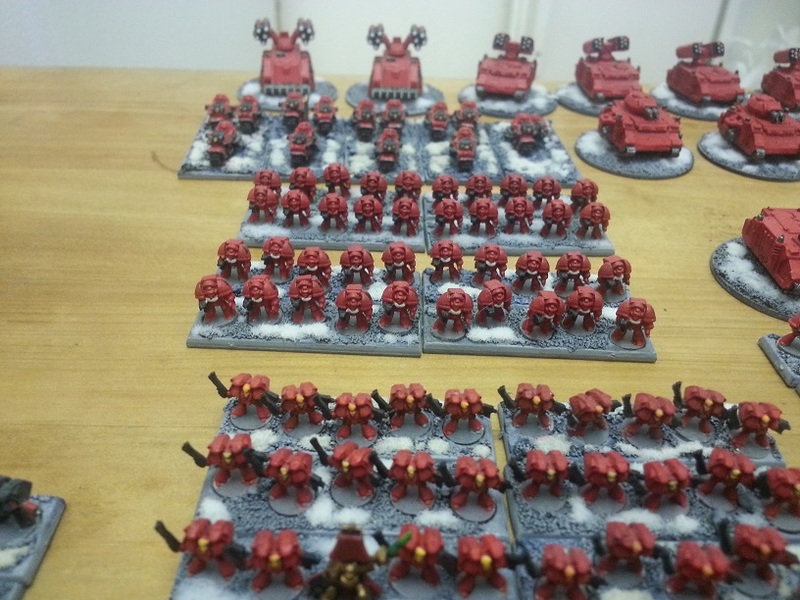 Here is my Epic Blood Angel Army, in all its glory! 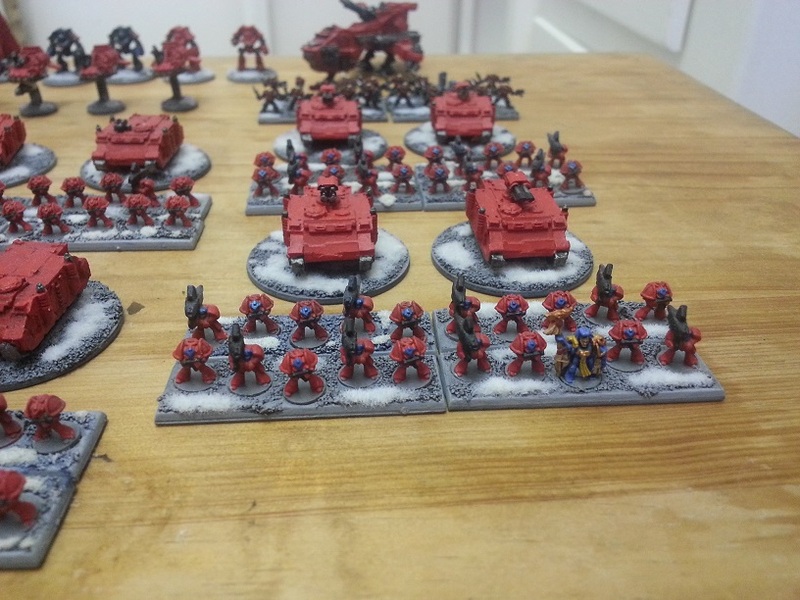 This entry was posted in Epic Armageddon and tagged Blood Angels, Epic 40k, Epic Armageddon, Epic Blood Angel Army on May 22, 2014 by xenocidalmaniac. 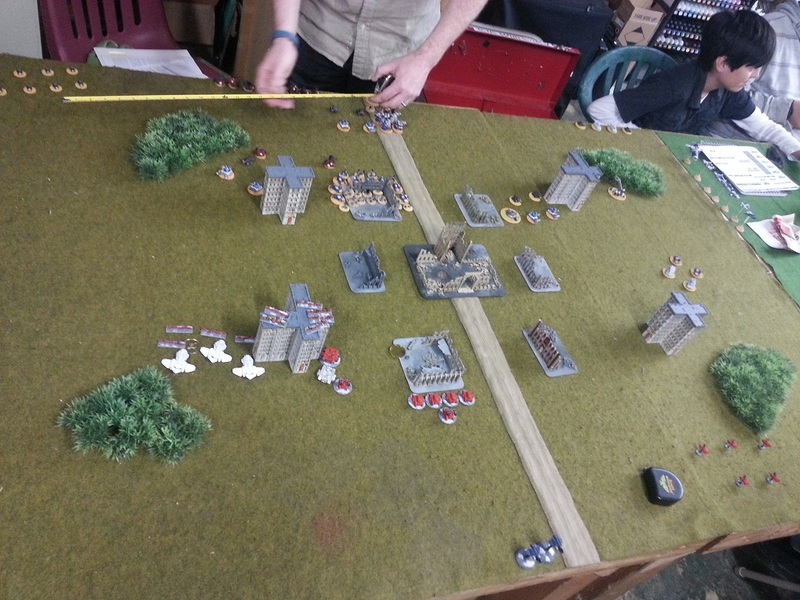 The Mighty Blood Angels take on Da Blue Bandit’s War Horde in the latest Epic 2014 League game. The Thunderbolts fail to activate and stay in the box of shame! 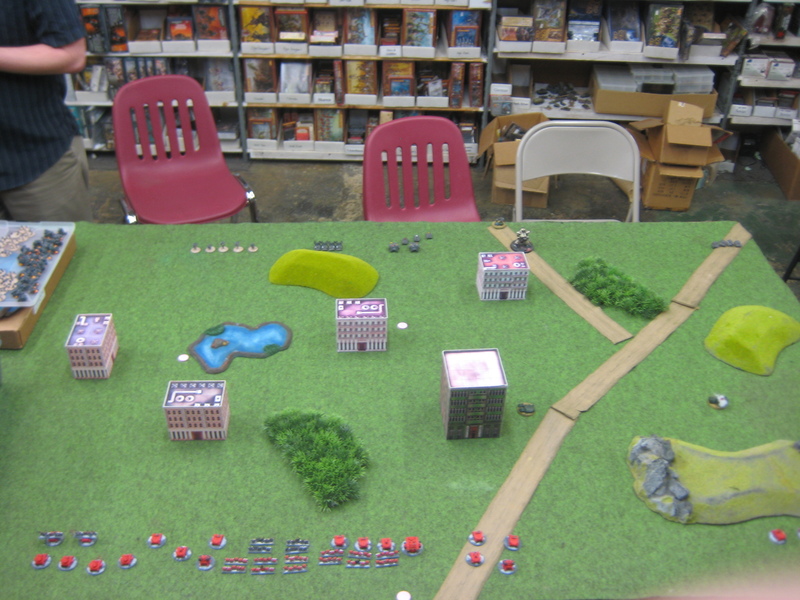 Unfortunately, the game store was closing and we had to declare the match a tie. Hoo-boy. Where to begin. 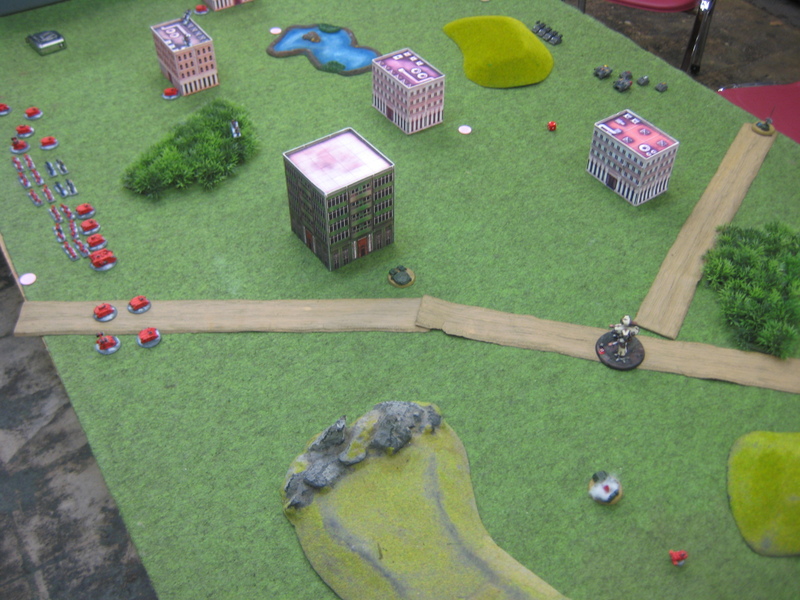 Well, it was an exciting and closely contested match. 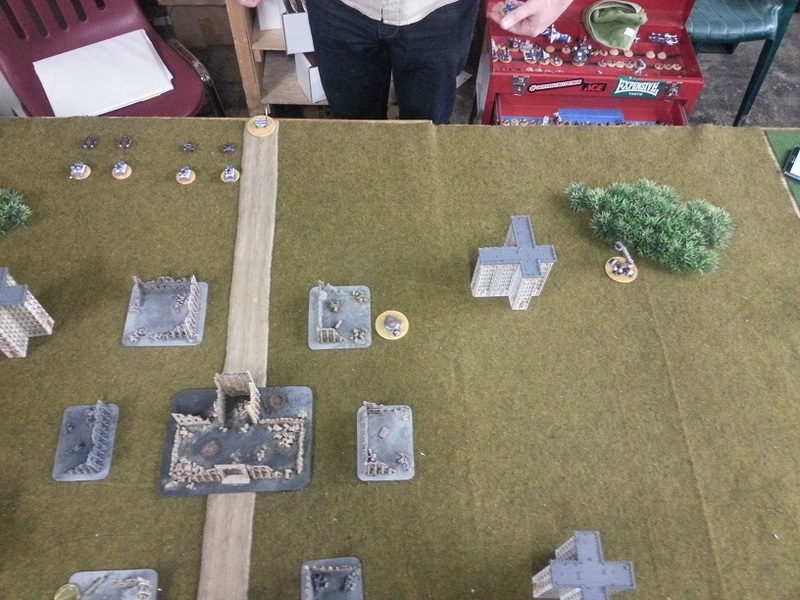 The Ork player is relatively new to Epic, but he is learning very quickly. It was a fun and very close game. 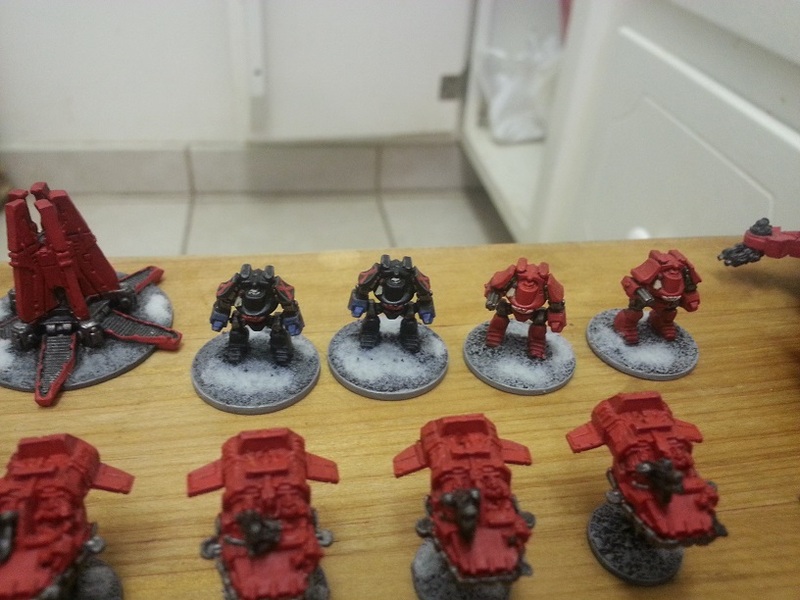 Eight-stand Assault Marine Squads – in the past, I have stated that this unit is useless or close to it. I stand corrected. They can be useful under certain circumstances. 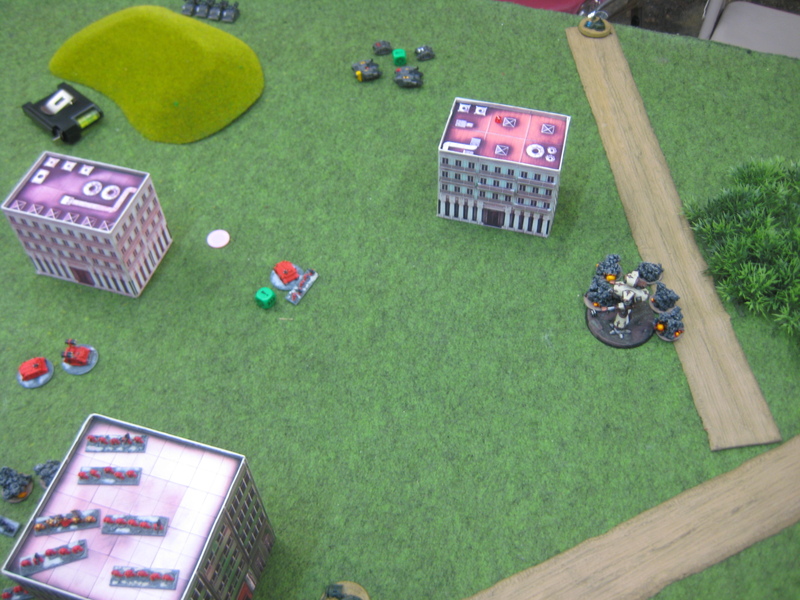 For coming in via Thunderhawk and mopping up isolated small units and grabbing backfield objectives, they can be useful. 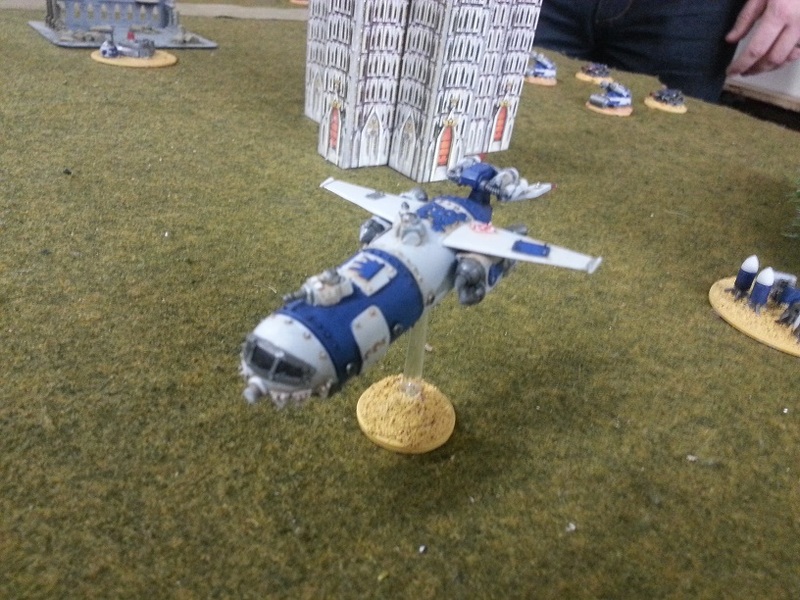 However, a Thunderhawk is absolutely required for this unit to be effective, making it a pretty hefty investment at 575 points. I’m not sure it’s 575 points useful. 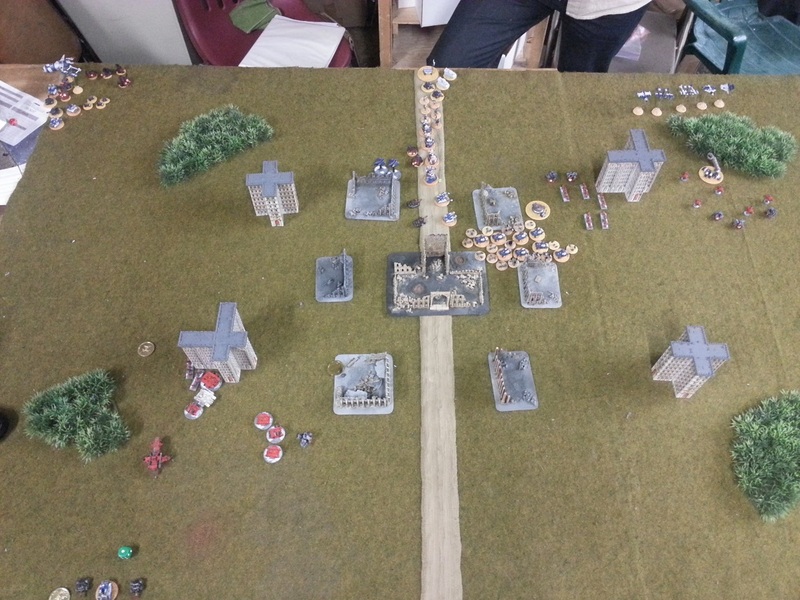 Baal Predators – While I had success with this unit the first time I ran it, I am becoming less and less impressed the more I use it. I absolutely can’t see what justifies a 300 point price tag for these. 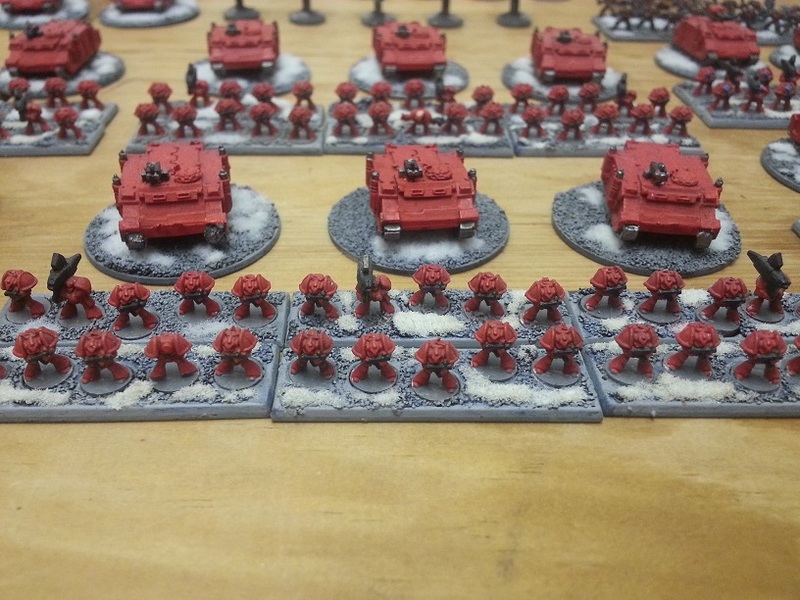 The problem is that they are only useful against infantry, but most infantry stays cooped up inside of their transports, and Blood Angels don’t have a lot of tools for cracking those transports. So, most of the time, the Baals end up firing on armor, a task for which they are ill-suited. 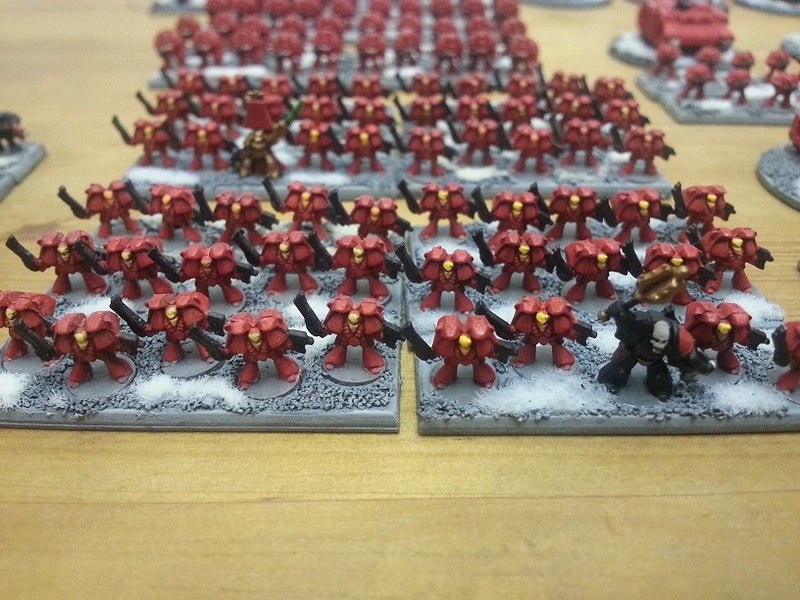 This unit should be 250 points maximum in my opinion, particularly in the context of the Blood Angel list. The list as a whole still feels woefully under-powered to me, especially against armor, in spite of the fact that I took Stormravens and more Land Raiders. 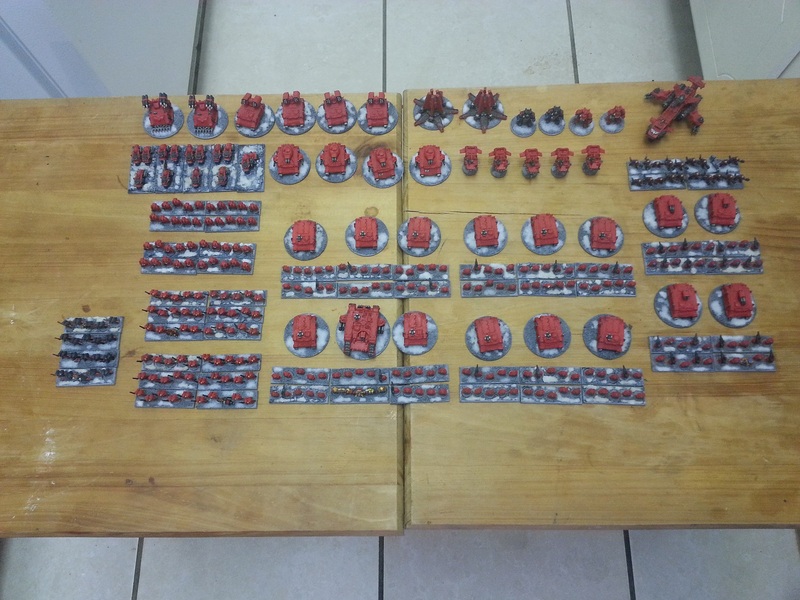 The Stormravens are simply too fragile to start on the table with, however, because all of the other Blood Angel units are so expensive, the 200 points that it costs to planetfall them is too much. 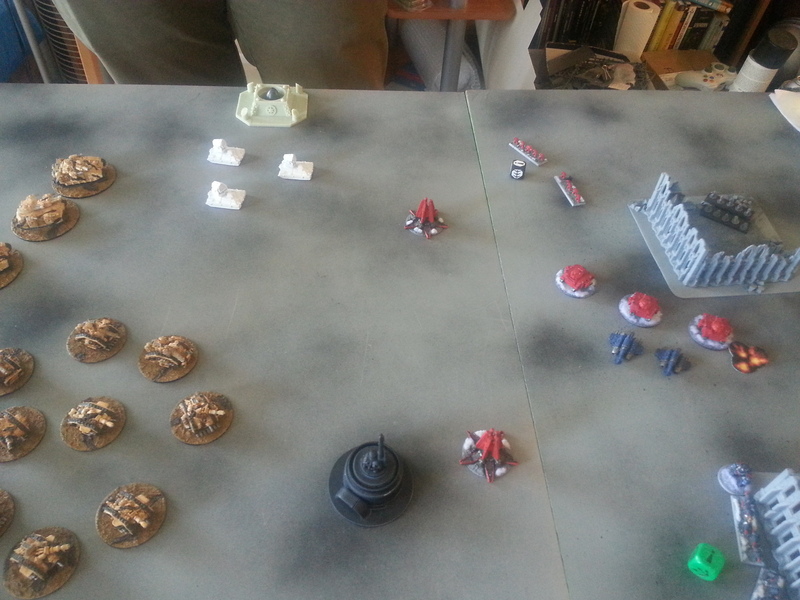 I was already very light on activations for this match even without burning another 200 on a spacecraft. 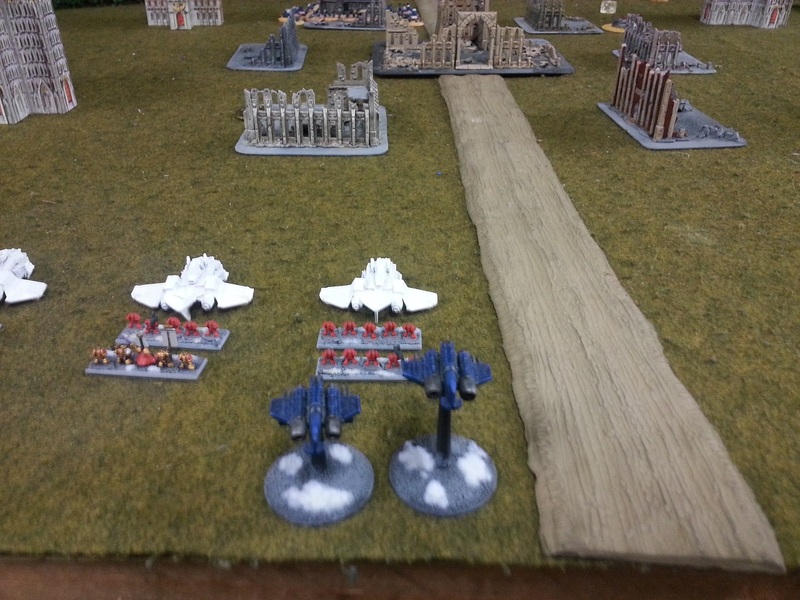 I almost feel as though Stormravens should be 50 points apiece, especially in light of the AT missile nerf. 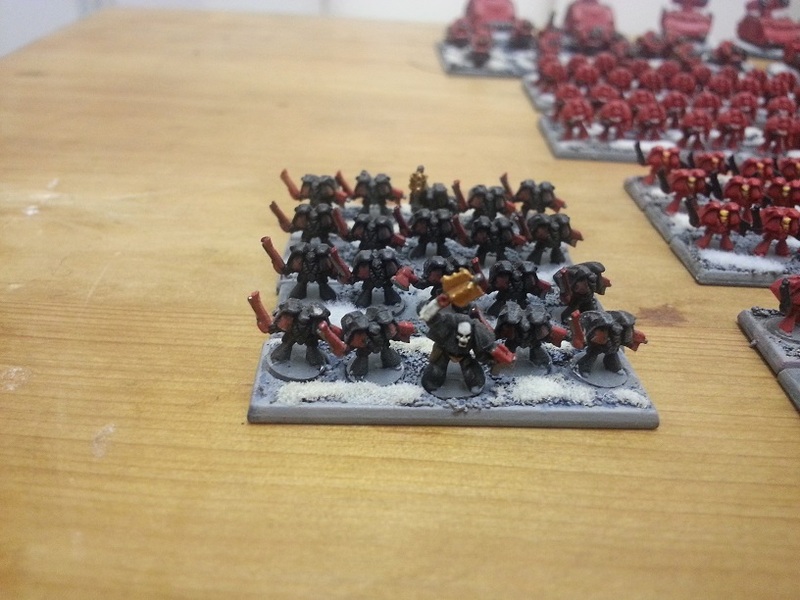 675 points is an absurd cost for my command squad consisting of six stands of tactical marines, three Stormravens, and a Hunter. Just too much. I never want to take that unit again. 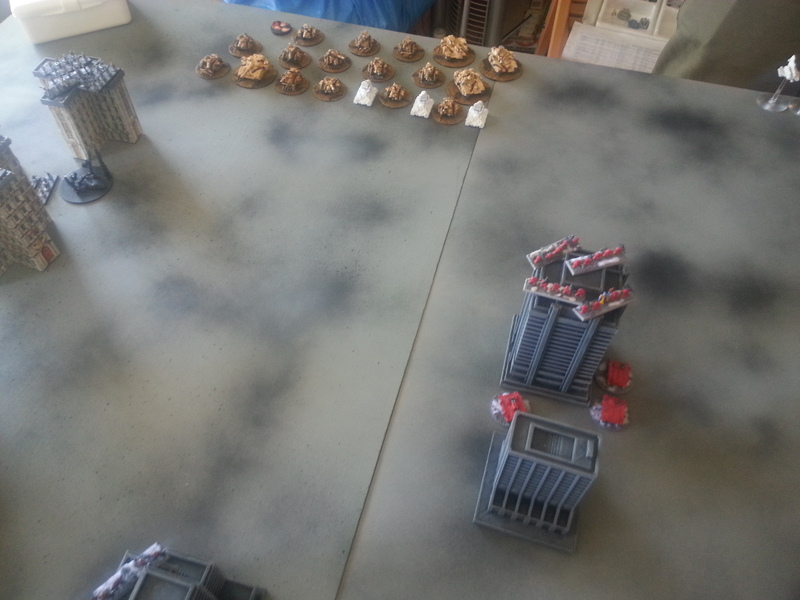 The Devastator squad with two Land Raiders performed decently and I will take that unit again. 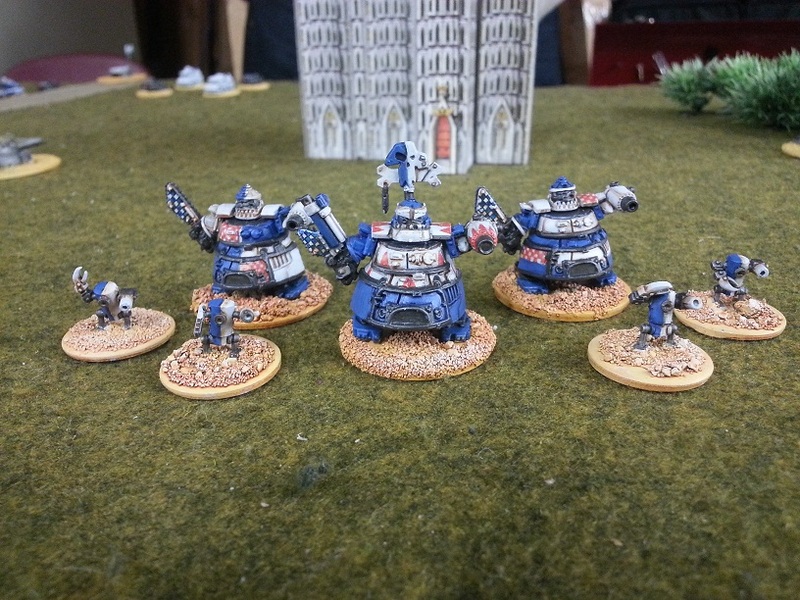 However, it’s a unit that any Space Marine list can take. 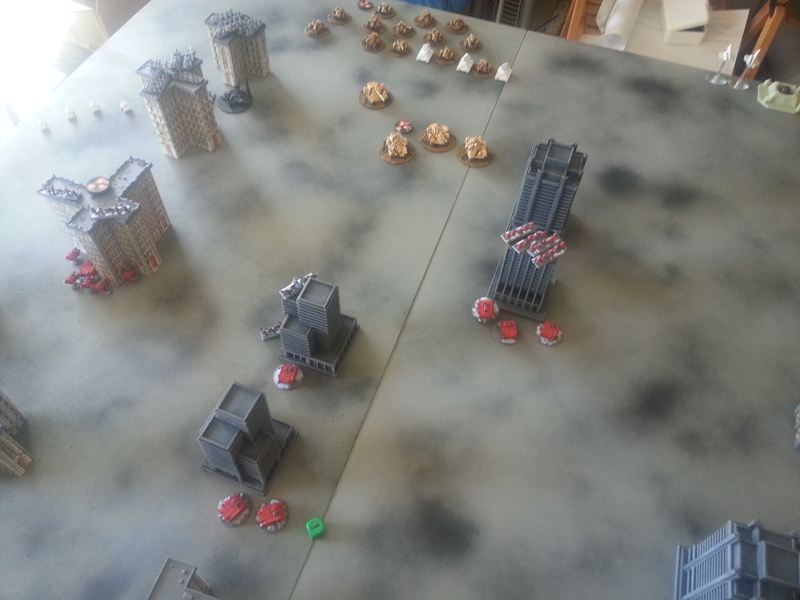 Due to the lack of AT weaponry in the Blood Angel list, the BTS objective is effectively off the table in every game. 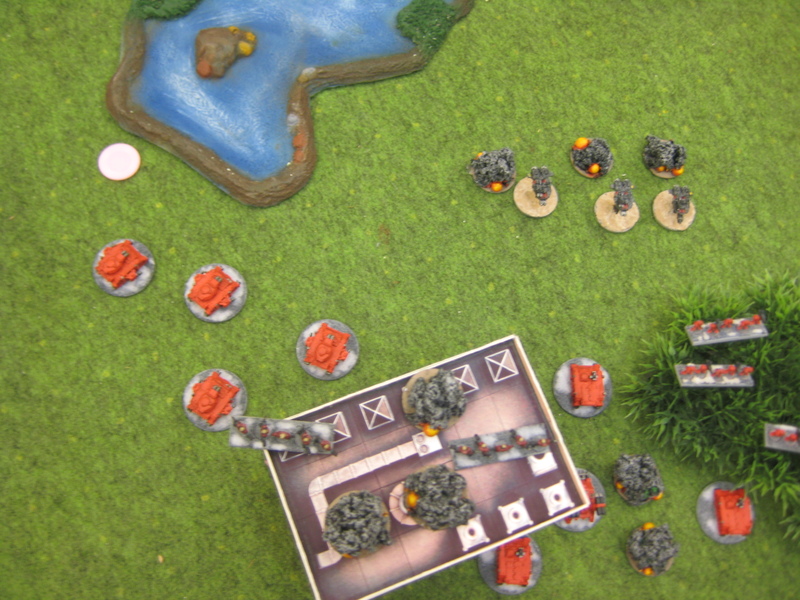 There was simply no way I could have destroyed that Stompa Mob through shooting, and I would have had to dedicate at least three or four units to assaulting it in order to win decisively and break it (which still would not have earned me the BTS). 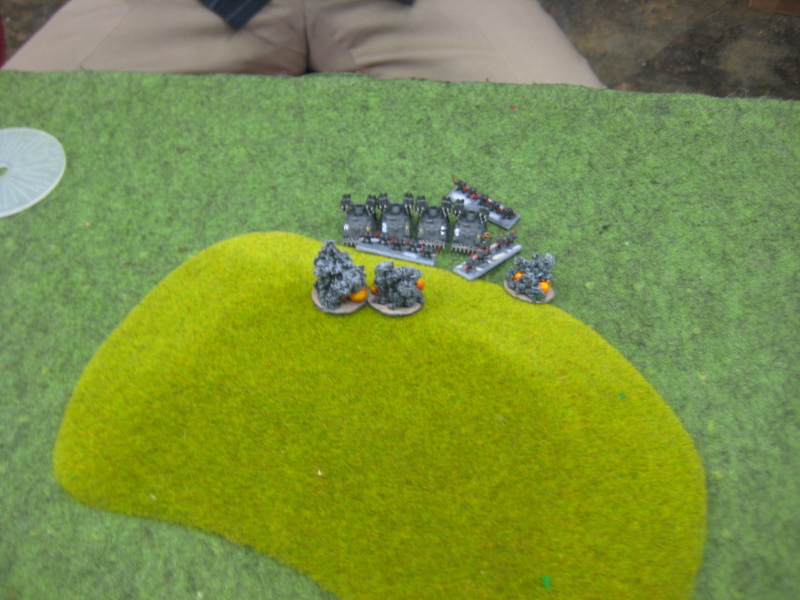 The Death Company with Furioso dreadnoughts, while powerful, just doesn’t pack the punch it needs to reliably break units like this. 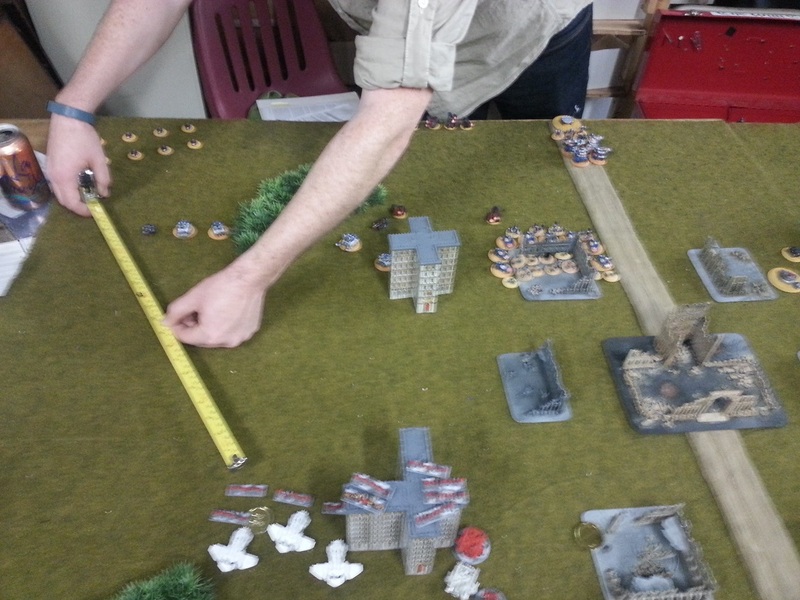 As a result, the Blood Angels enter nearly every game with a one-objective handicap. 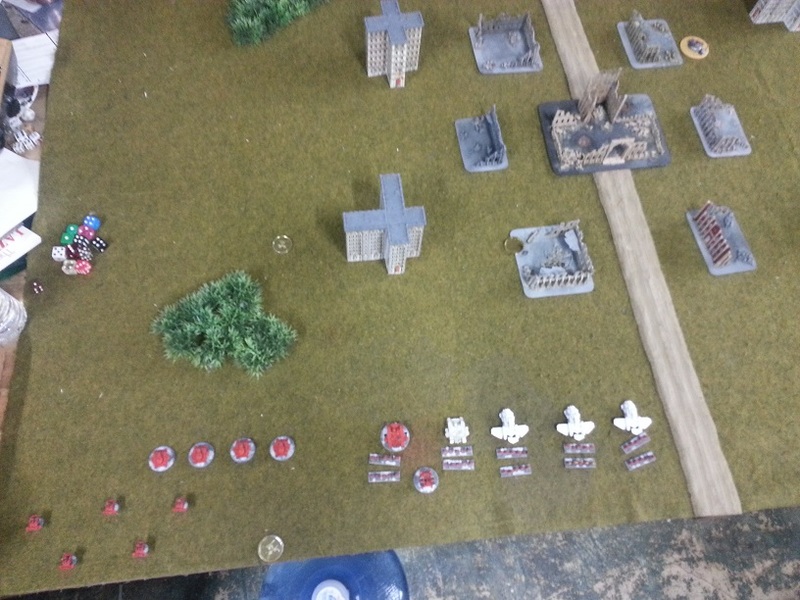 Even being gifted with the Ork commander’s poor decisions – the Landa strafing run and then the poor placement of the Big Warband (giving me TSNP objective), I only managed a tie. Had the game gone to turn four, I am nearly certain I would have lost. 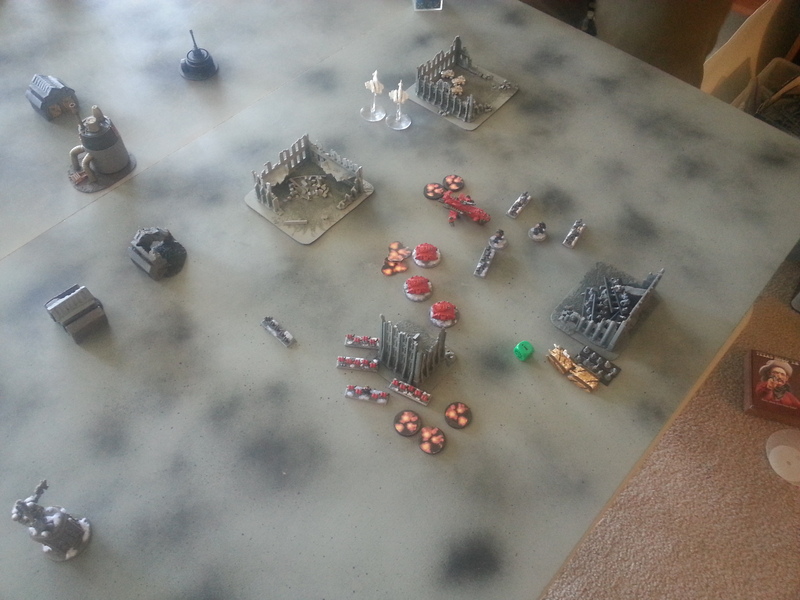 I should also note that I was running the Furioso Dreadnoughts at a 50 point cost. 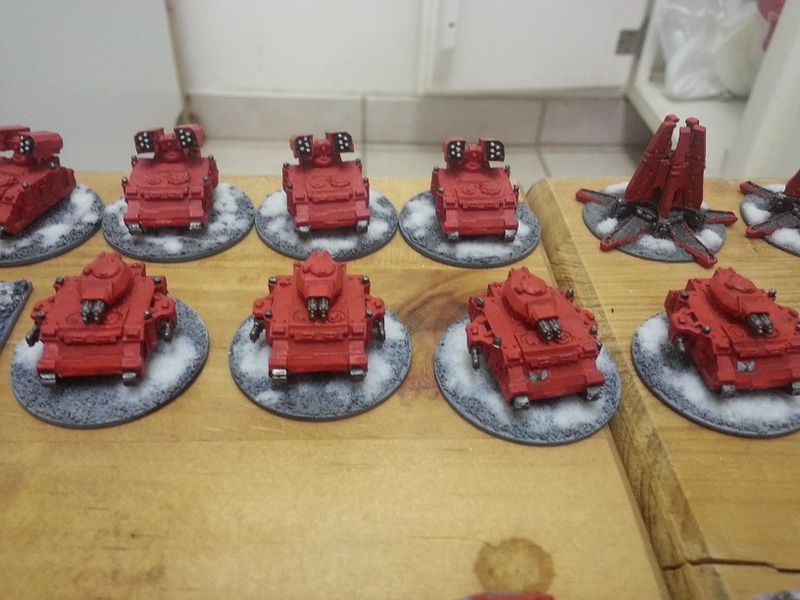 I love the Blood Angels, but I can’t help but feel that justice is not being done for this venerable chapter with the army list as it stands. 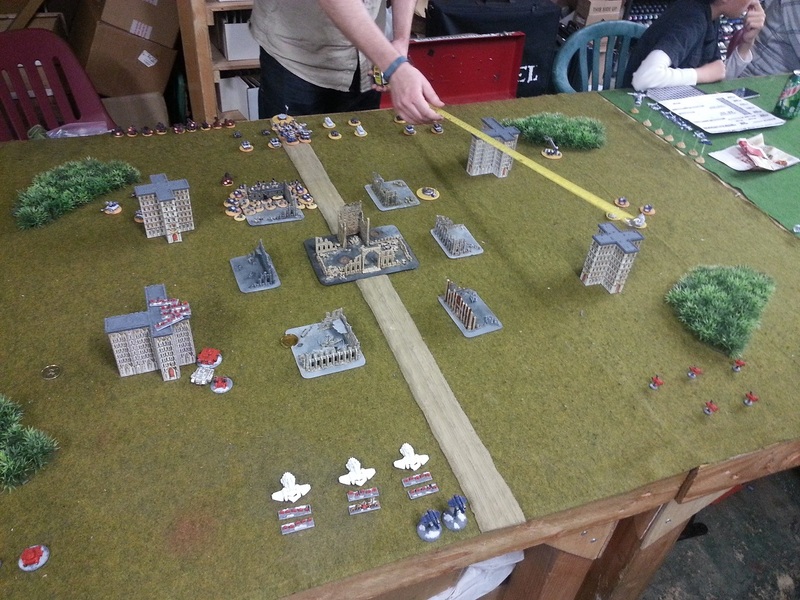 This entry was posted in Epic Armageddon and tagged Blood Angels, Epic 40k, Epic Armageddon, Orks on May 9, 2014 by xenocidalmaniac. Hello! 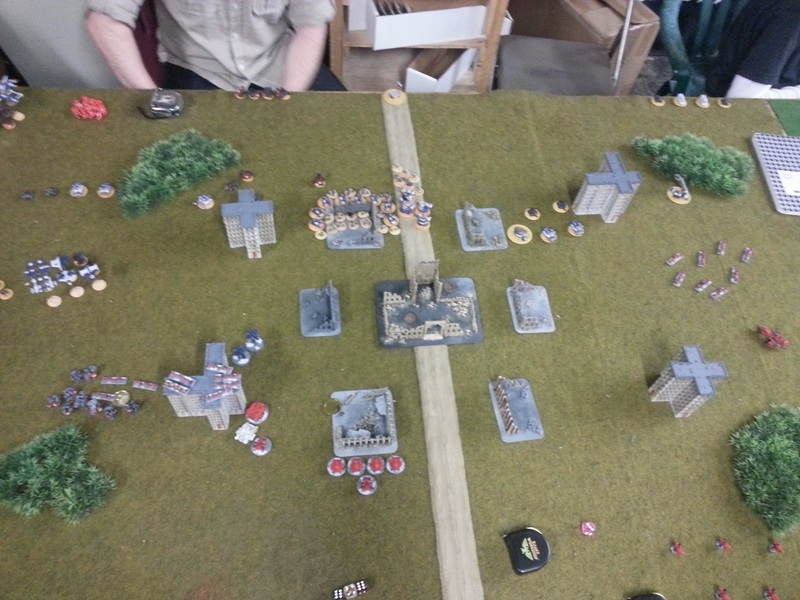 Here we are with a battle report from out Los Angeles Epic League 2014. 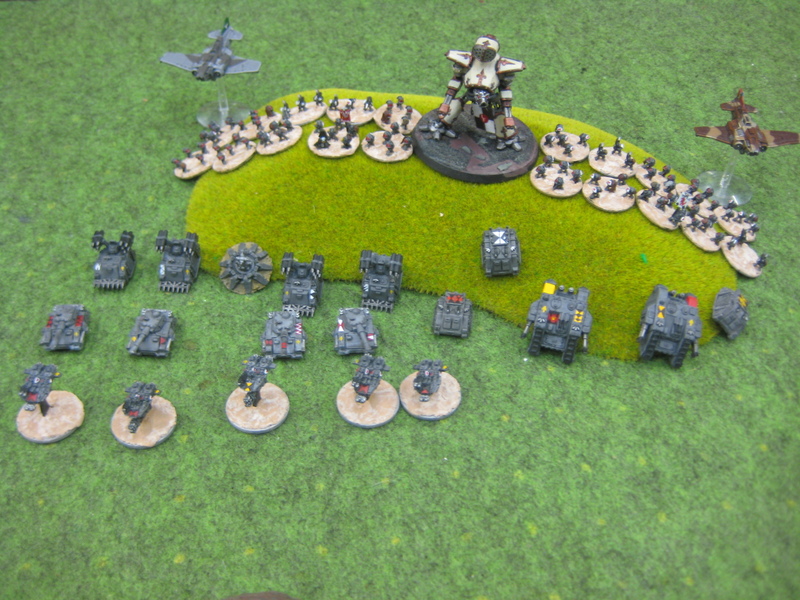 The Steel Legion army is not completely painted unfortunately. 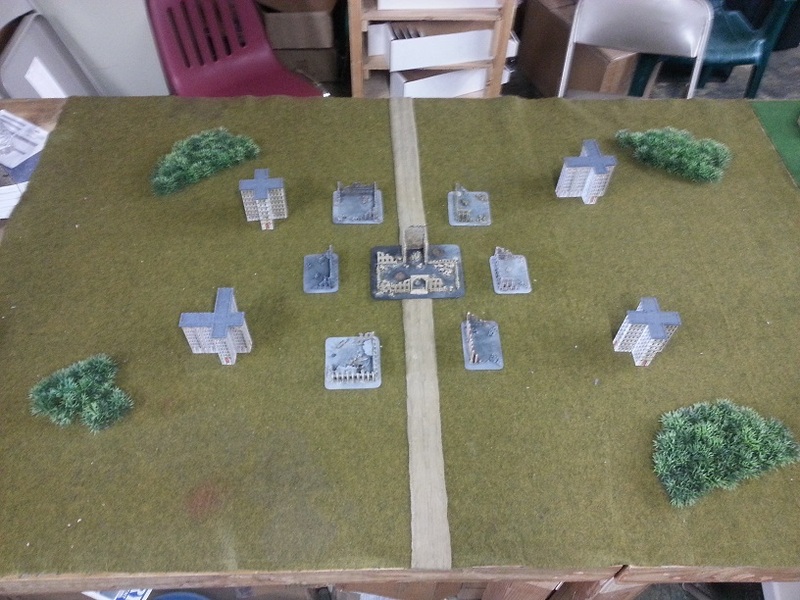 Ordinarily I am reluctant to make a batrep unless the armies are 100% painted, but, in the interest of gathering playtest data, here it is. 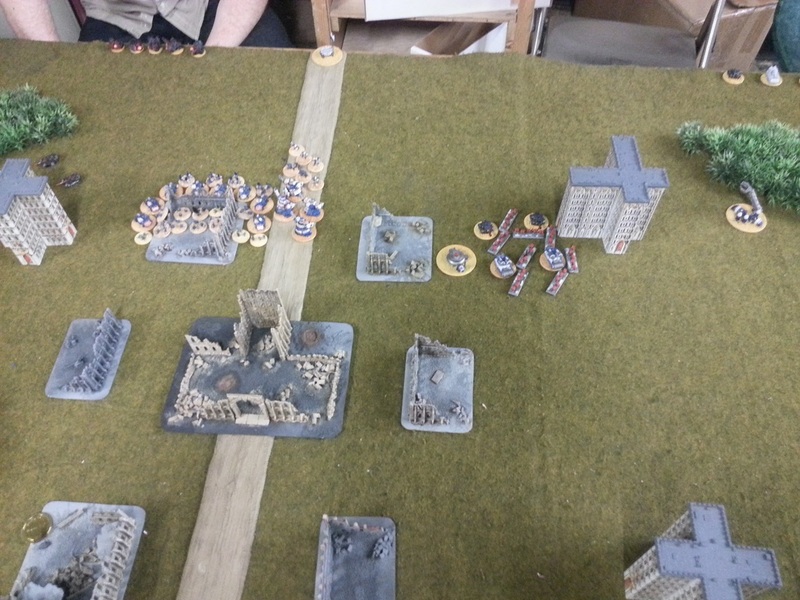 Blood Angels win the strategy roll and force the Steel Legion to go first. 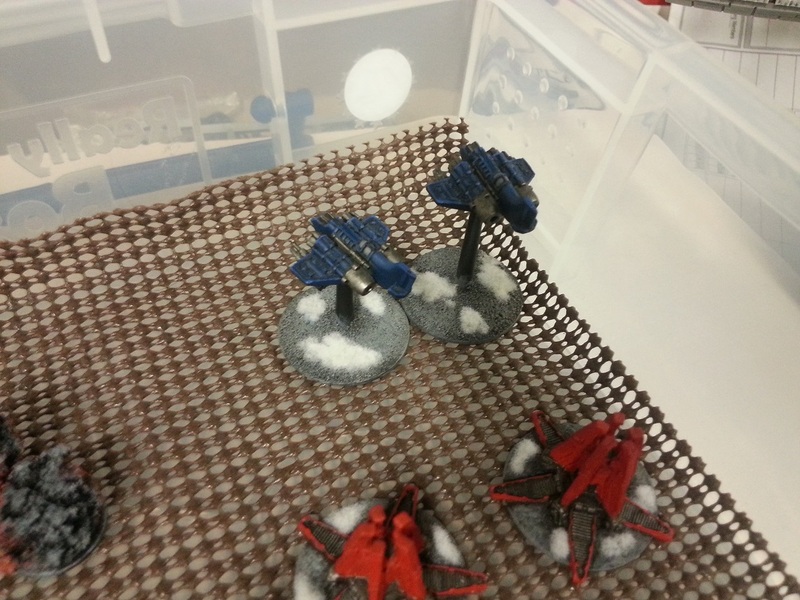 Space Marine Drop Pods arrive. 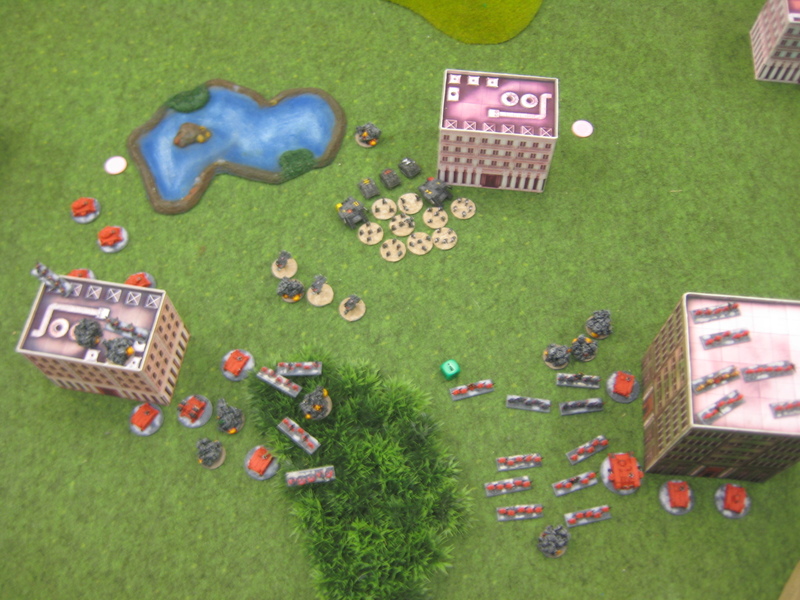 This was a pivotal issue in the game – The Steel Legion commander had correctly predicted the location of the Space Marine drop in the center of his own deployment zone, and set his forces up to pincer the dropping marine forces. 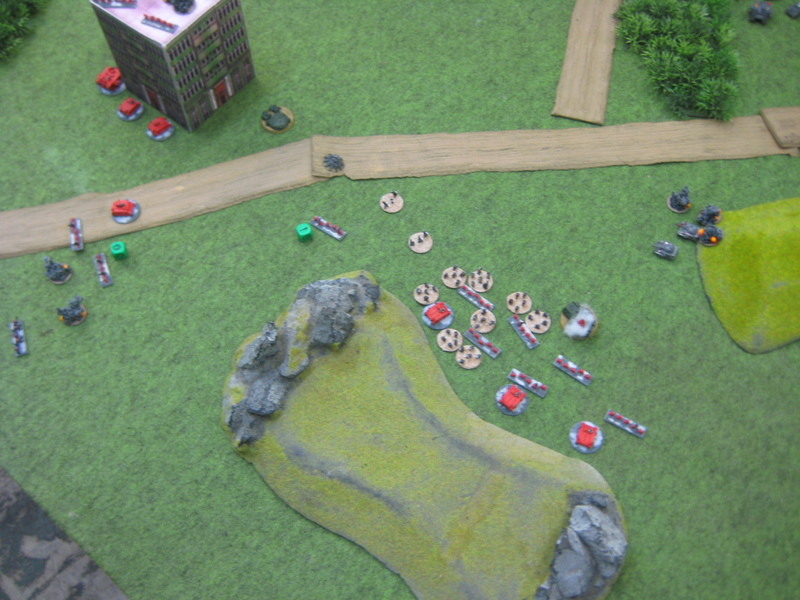 The Marines tried to alter their drop zone as far as possible from the Leman Russ Company hoping to establish a beachhead on the right flank, but were still left exposed and in poor position. 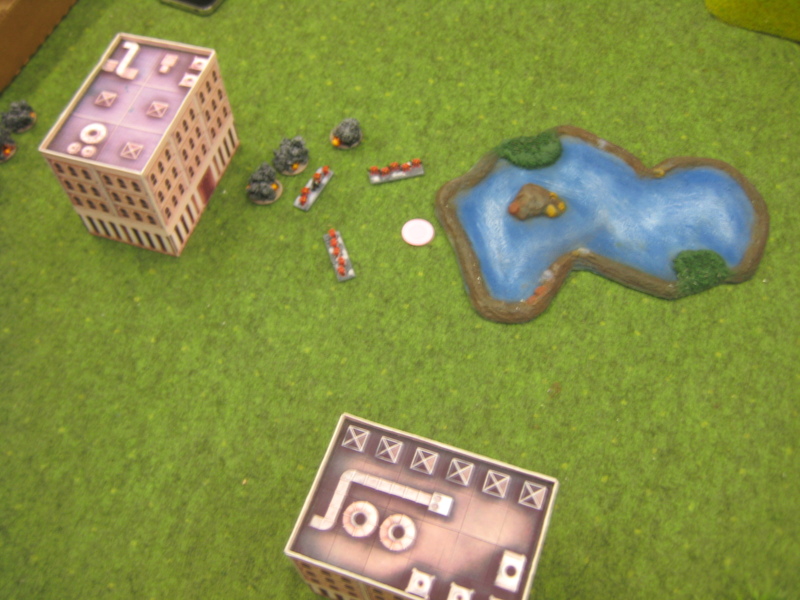 One Tactical Squad opened fire on the broken Regimental HQ, killing all but two stands. 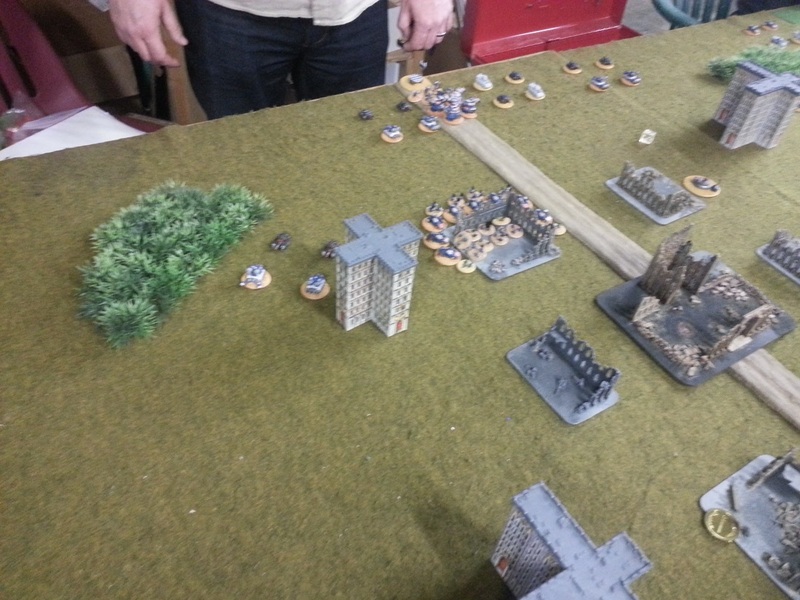 The vengeance of the Leman Russ Company is swift and furious. They double, open fire on the other Tactical Squad and break it. 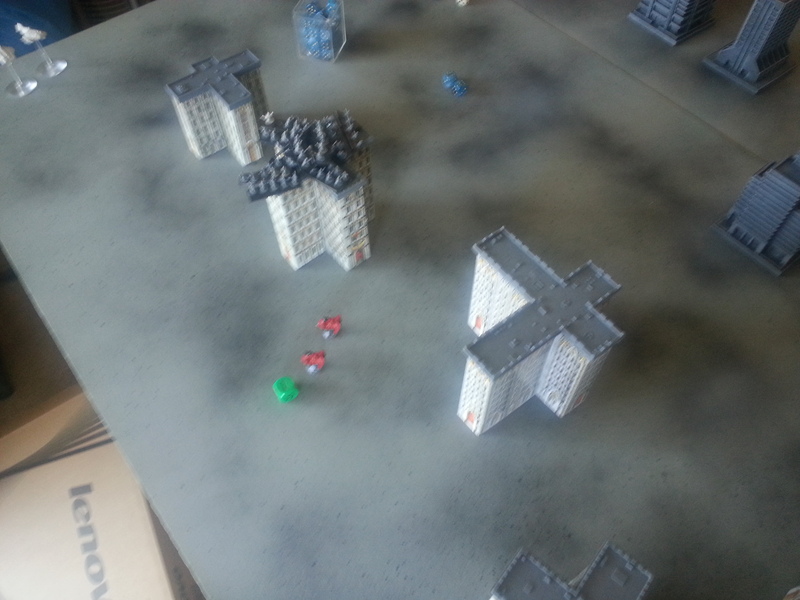 The Tac Squd retreats to nearby ruins. 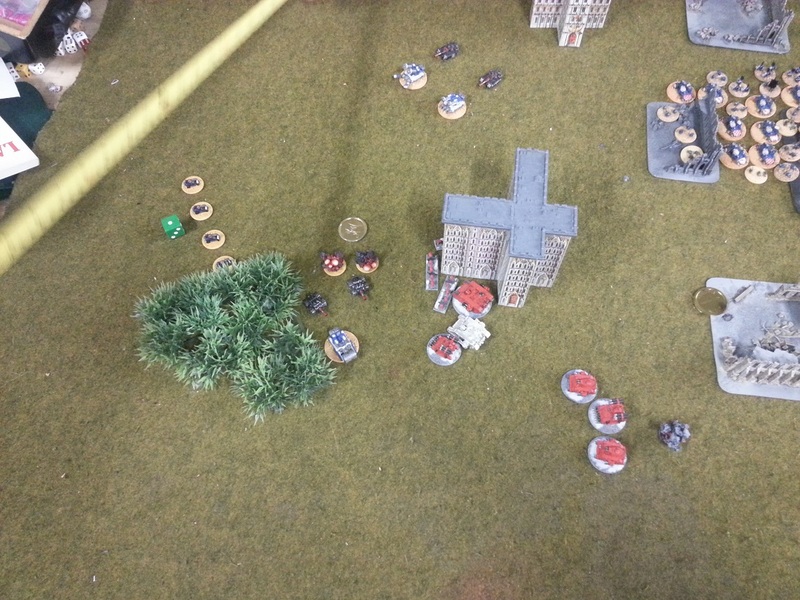 The Devastators manage to force three rounds of combat! 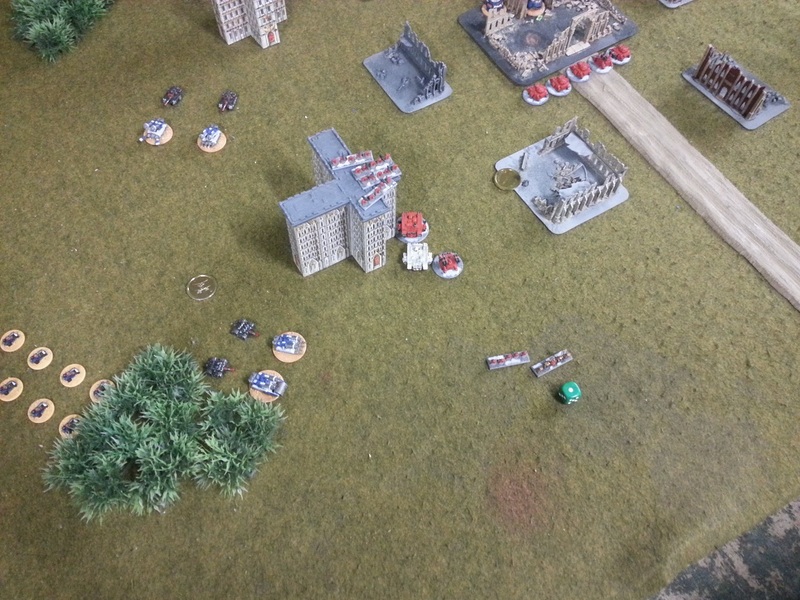 Alas, the Russes are just too strong. 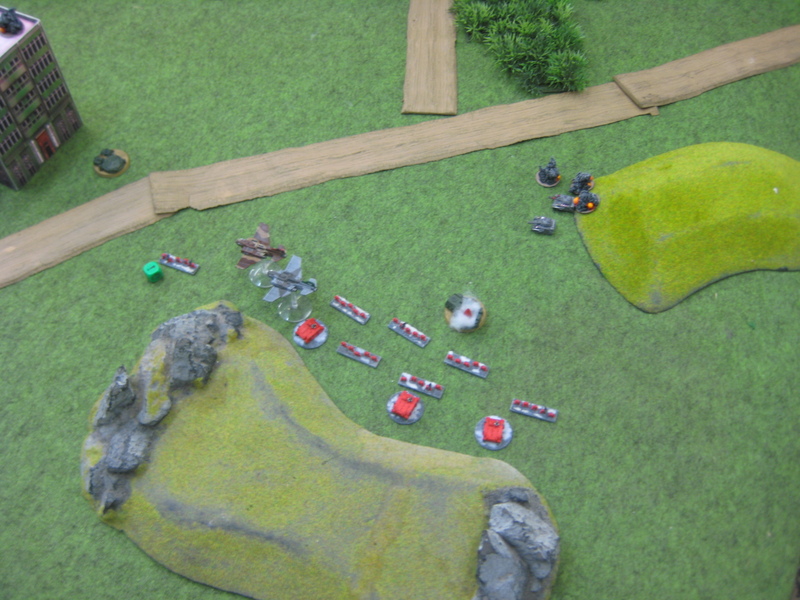 But the Marines manage to take three tanks with them. 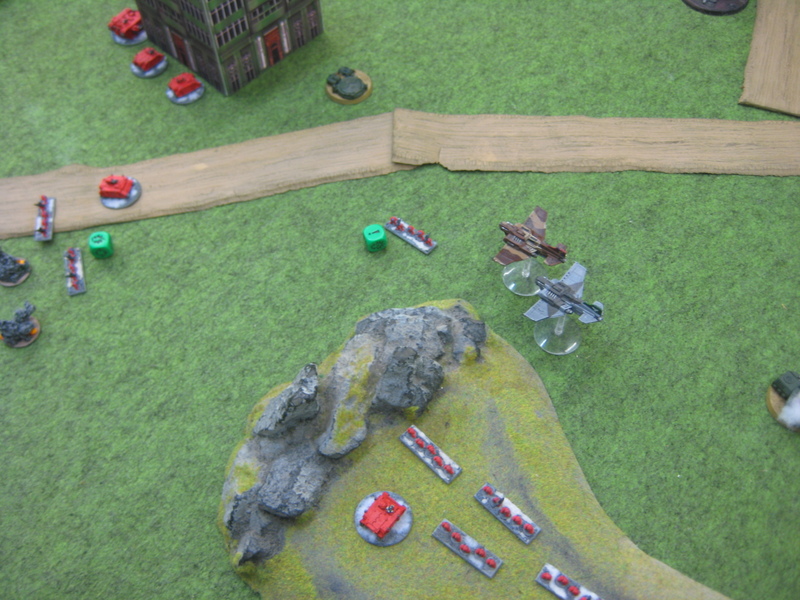 The Death Company Thunderhawk Assault goes horribly wrong. 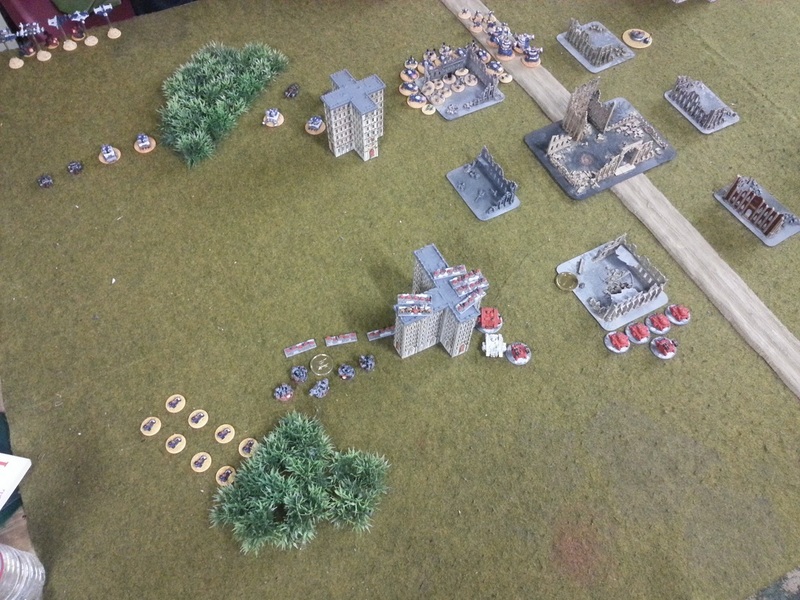 Despite only needing to roll a 3 to tie the assault or a 4+ to win, the dice come up double-twos, and they lose. 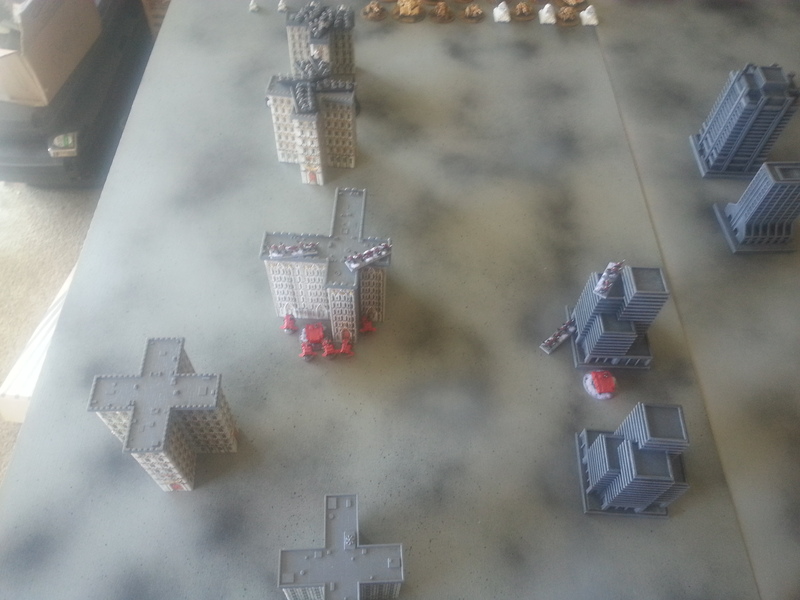 In the Rally Phase, the only Blood Angel formation that manages to rally is the Death Company, who, of course, cannot capture objectives. 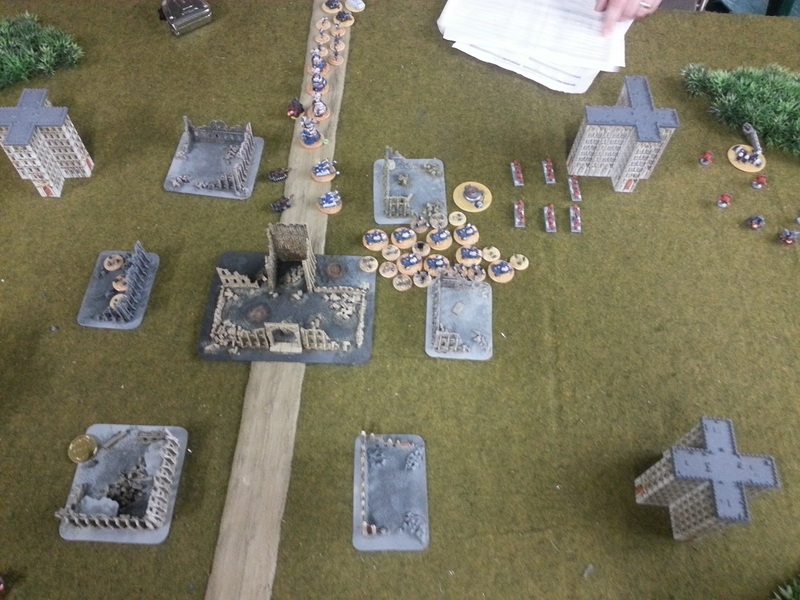 At top of 3, the Angels only have four unbroken formations left (one of which cannot score). 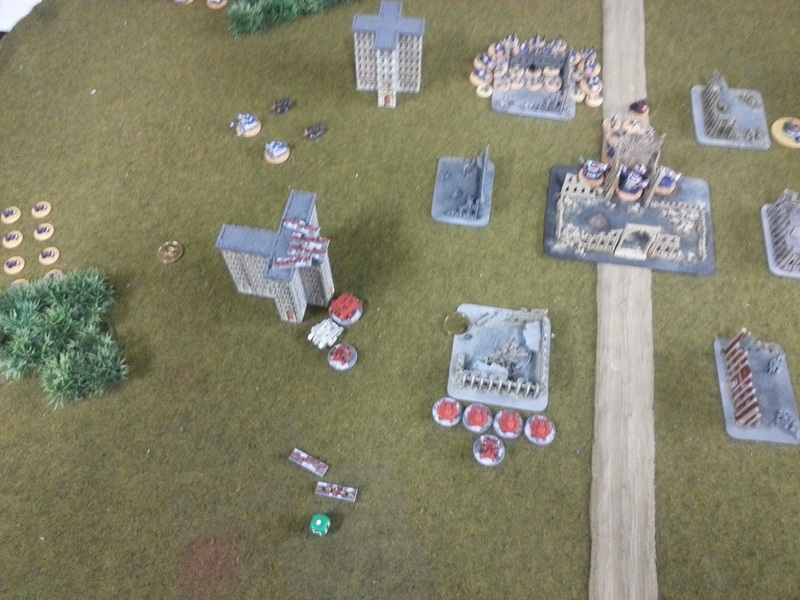 The Leman Russ Company opens fire on the Death Company and destroys it, sealing victory with Break Their Spirit and Defend the Flag. 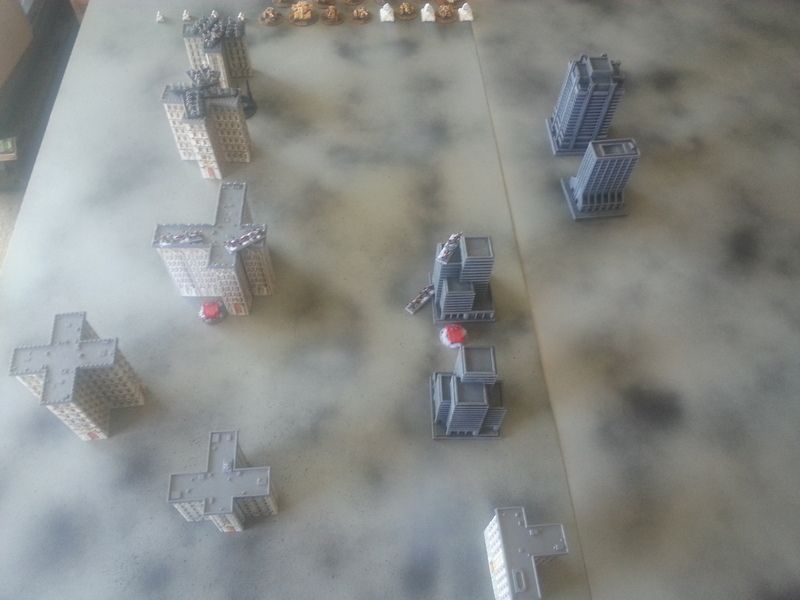 The Blood Angels do not have enough unbroken formations to contest or take any objectives with. 1. 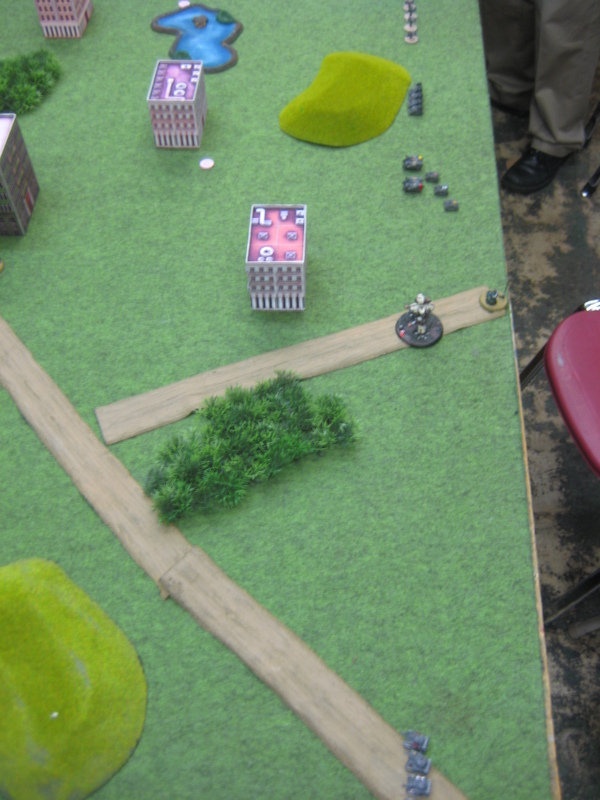 First of all, kudos to the Steel Legion commander for setting up that drop zone trap. And shame on me for falling for it. That was a huge blunder that was difficult to recover from. Ordinarily, however, I don’t think it would have necessarily been a fatal mistake, but several other factors combined to make victory very difficult for me. 2. 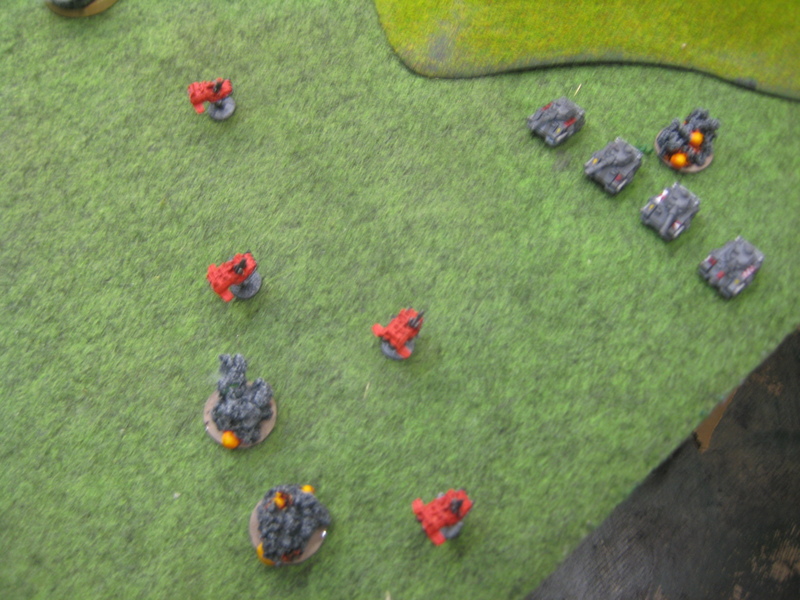 Blood Angels have no anti-tank. 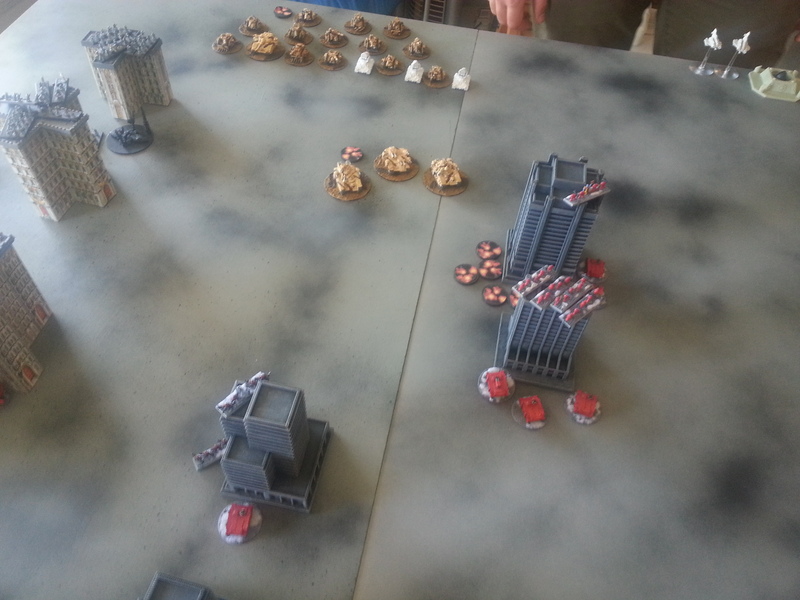 There is basically no way I could have dealt with that huge 13-strong Leman Russ Company. 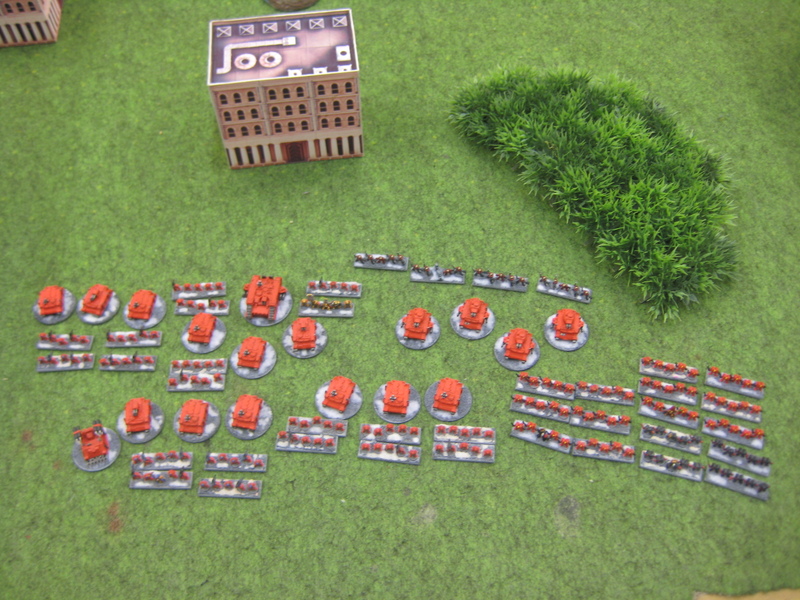 I did get close to breaking it in assault, but, with so many tanks, any given Space Marine formation is likely to be outnumbered, sometimes even 2-to-1 just going in. 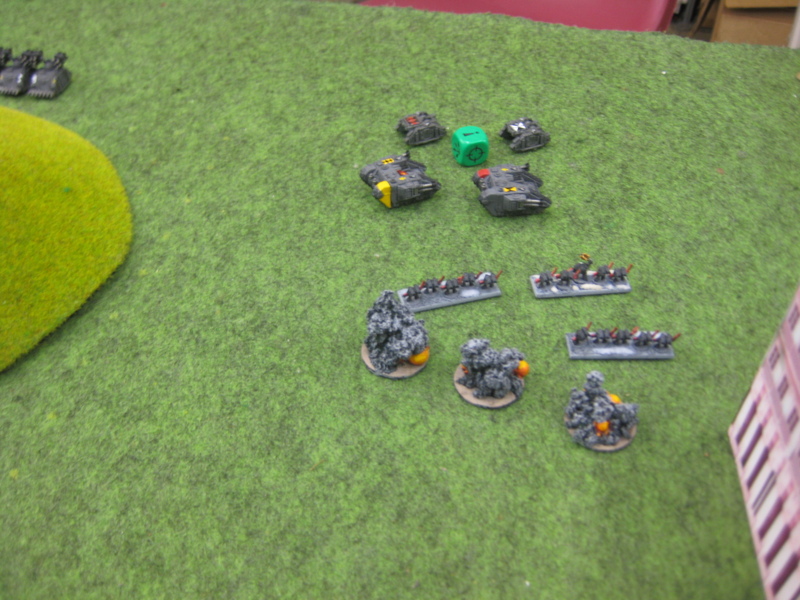 In the way of anti-tank shooting, I only had the Razorbacks and missile launchers, which needed 7s most of the time. 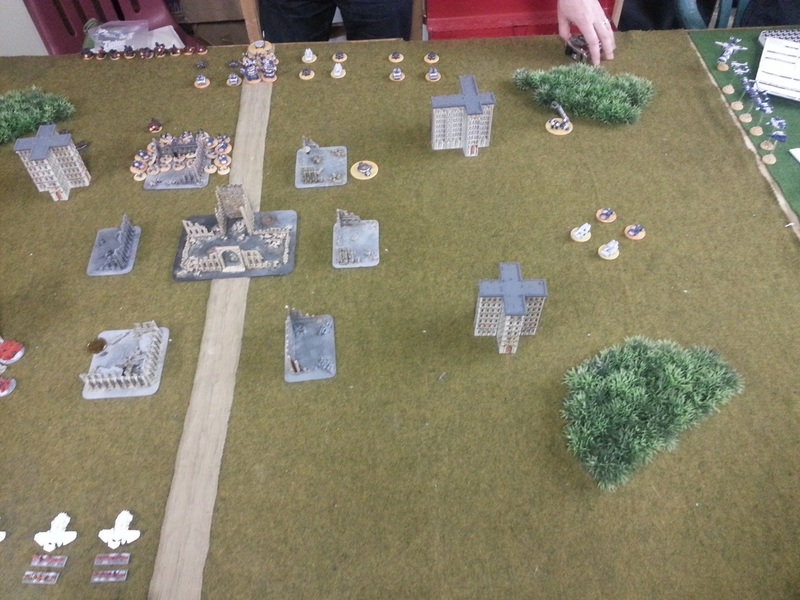 There just is no way for this list to deal with Baneblades and Russes short of assault. 3. Bad dice-rolling. 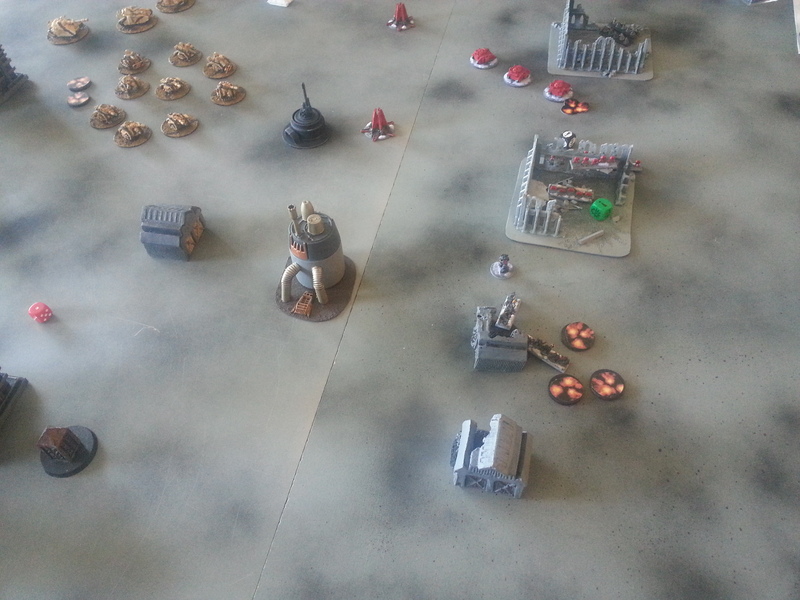 Couldn’t rally any units, failed a bunch of activation checks, etc. 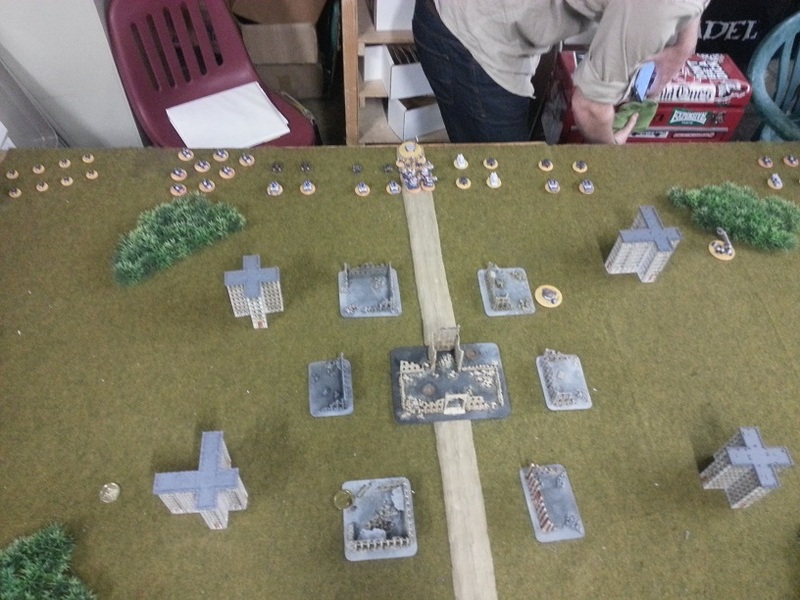 I feel like BA dice-rolls need to be on point going up against a bad matchup for the army such as Steel Legion, and the dice just weren’t there for me. 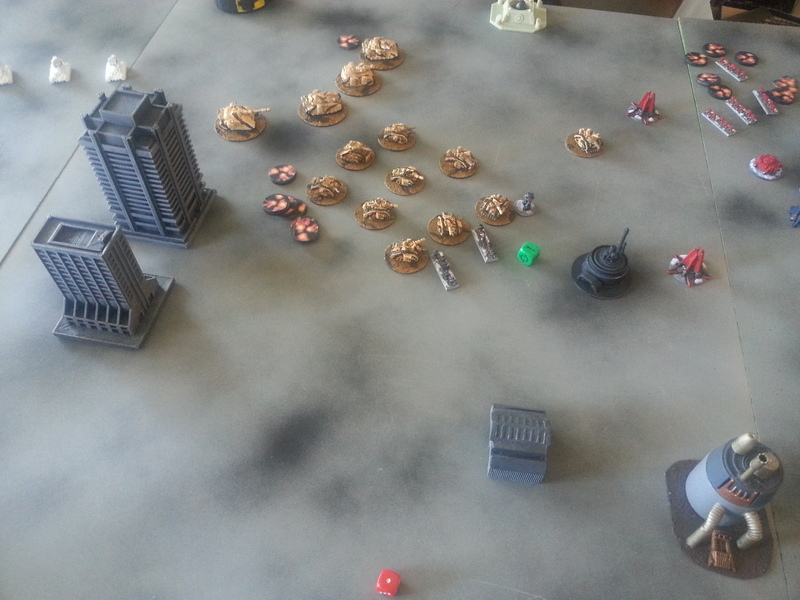 Perhaps it is a reflection of a weakness in the list that there is no room for bad dice rolls. 4. 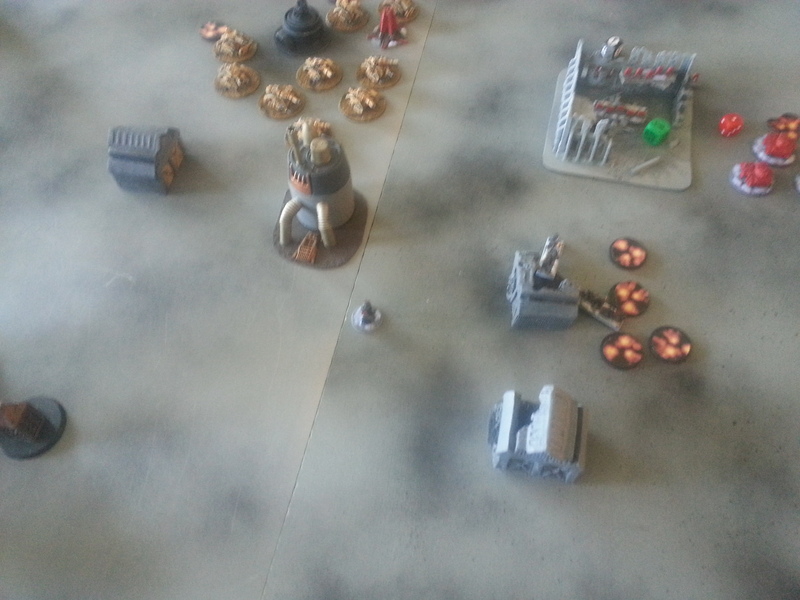 Furioso dreadnoughts are not worth 75 points. For what they bring to the table, I can’t see why they are so expensive. 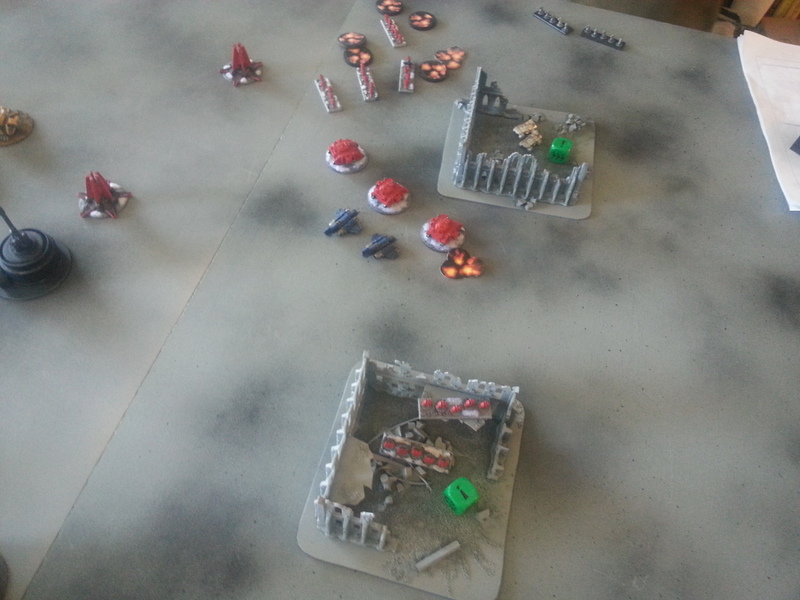 At 50, they might be worthwhile – I could have had two additional LasCan Razorbacks with those additional points. But even at 50 they are far from “auto take”. 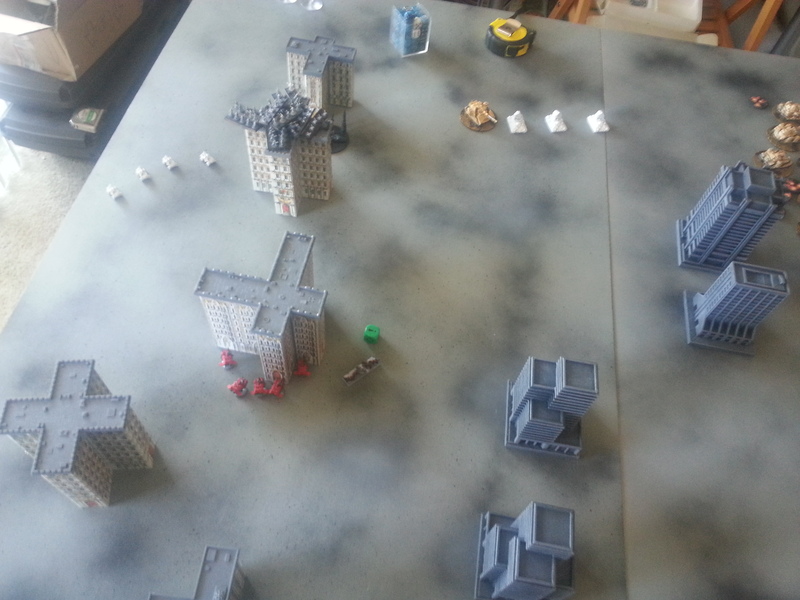 Seems better to load the Thunderhawk up with Death Company and a Devastator formation. 5. 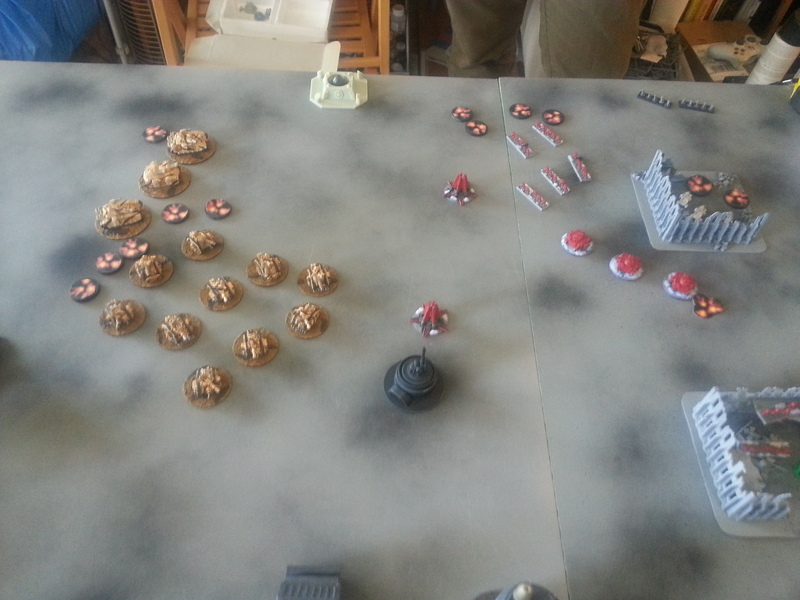 I think Stormravens could have helped against Steel Legion with their AT missiles and alpha strike abilities. Unfortunately, however, I have pledged all painted for this league, and I didn’t have my Stormraven models painted up yet. 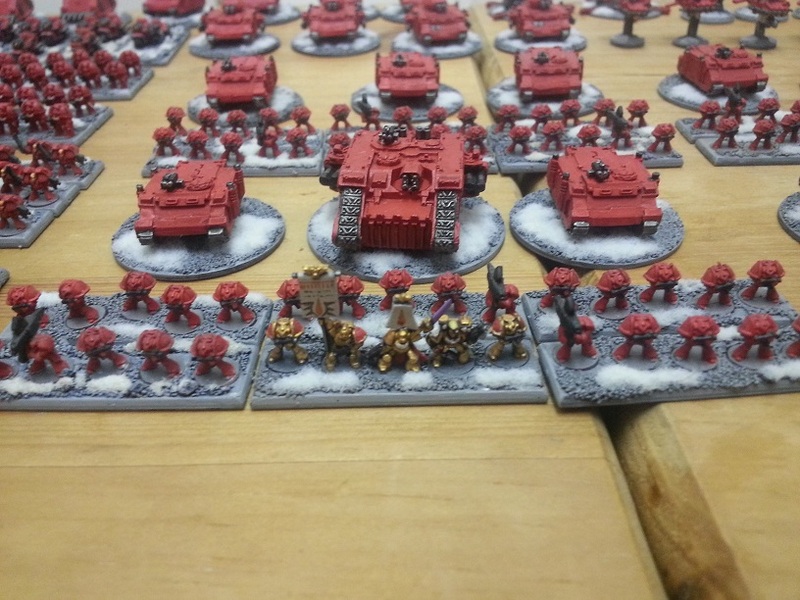 This entry was posted in Epic Armageddon and tagged Blood Angels, Epic 40k, Epic Armageddon, Steel Legion on March 18, 2014 by xenocidalmaniac. 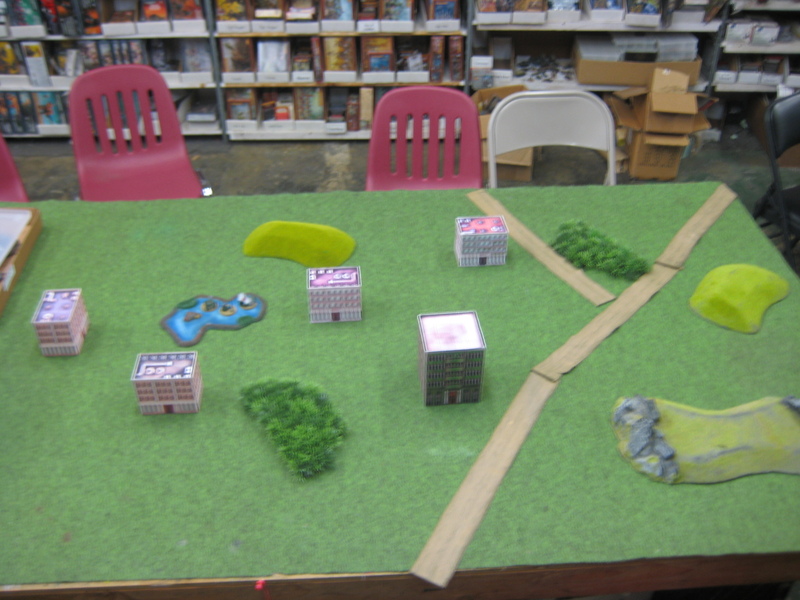 This is the first league game to determine the fate of planet Maarkus IV! 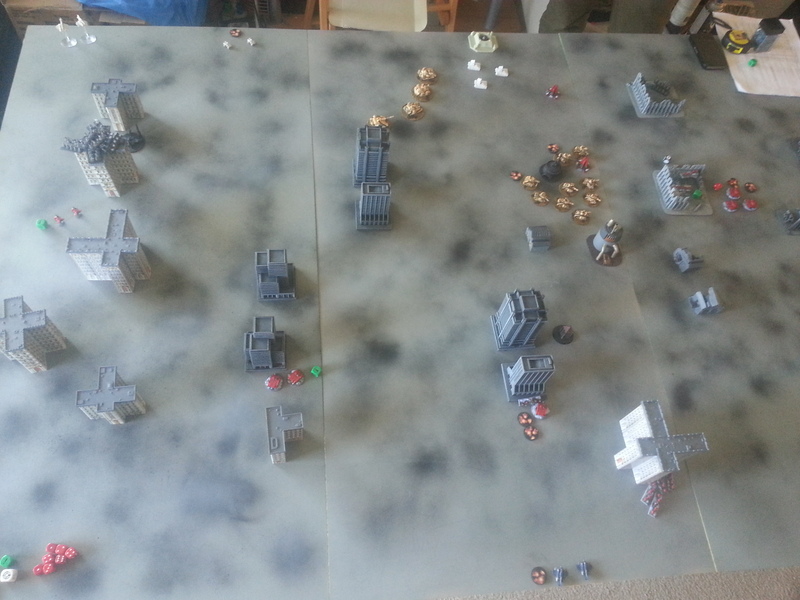 Both the Blood Angels and the Space Wolves are laying claim to the glory of bringing the planet back into the Imperial fold, but only one can win. 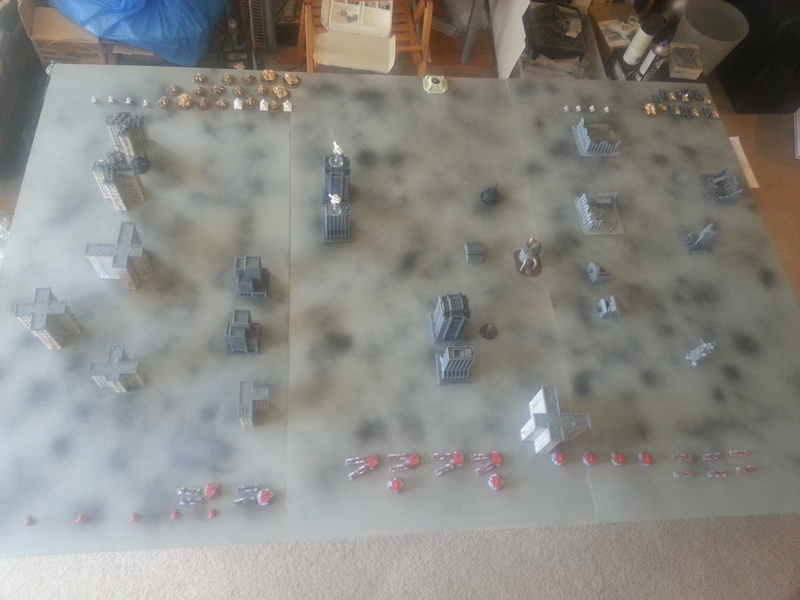 The Blood Angels set up across the entirety of the board with Baal Predators and Scouts on the left flank, Two Devastator formations, Two Assault Formations, the Death Company, and the Command Tactical Squad in the center, and a Tactical formation and Land Speeders anchoring the right flank. 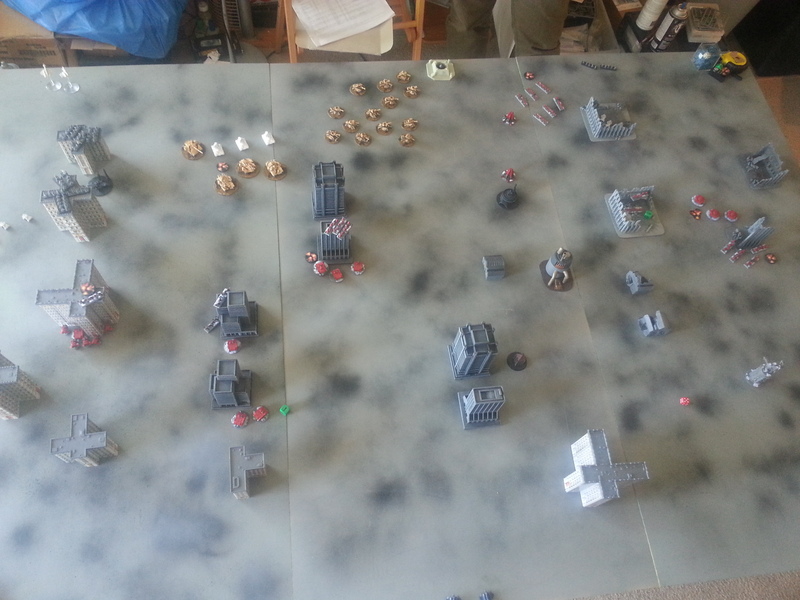 The Space Wolves set up with their Reaver Titan in the center, Annihilator Predators on their left flank, Land Speeders on the right, and Command Great Company holding down the center. 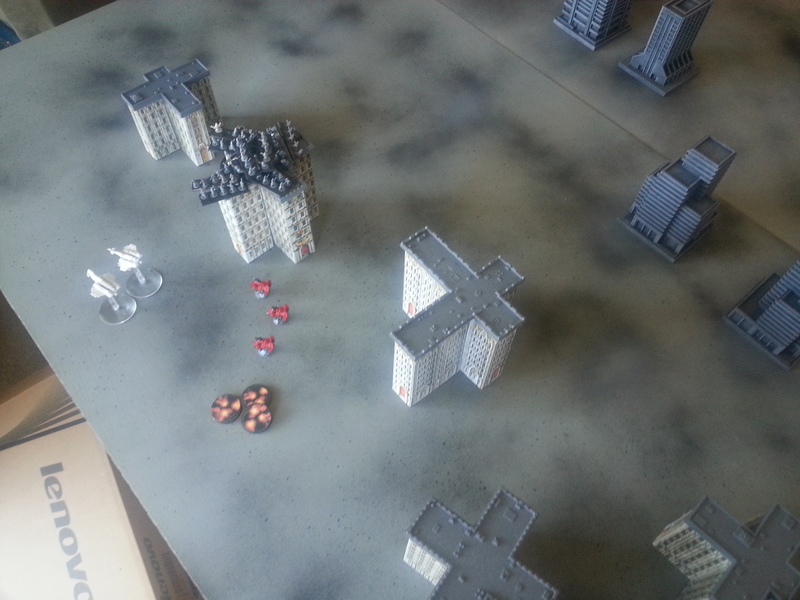 Another Great Company waits in orbit on the Strike Cruiser, which will arrive Turn 3. 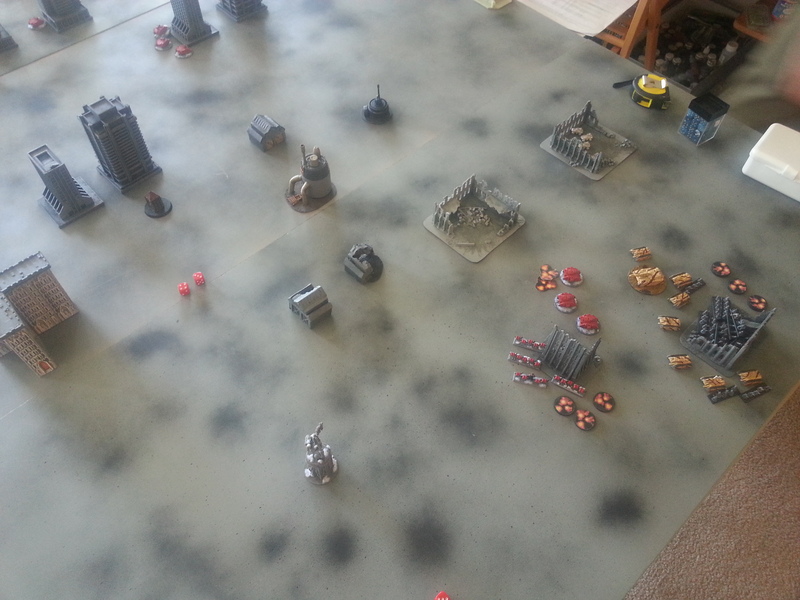 Here you can see the two Blood Angel objectives to the right, and the Space Wolf objectives toward the left, represented by pink chips. 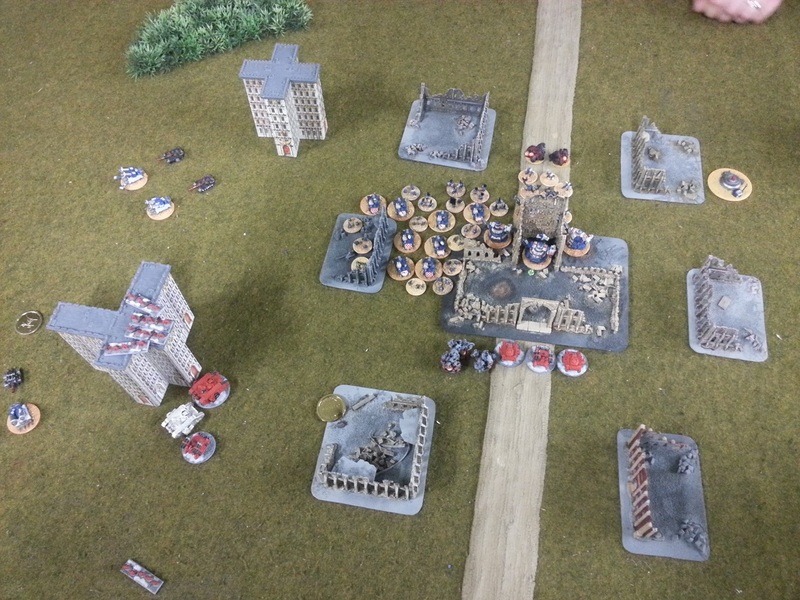 The Blood Angel Command Tactical formation advances into cover and opens fire at the Space Wolves in the building, failing to do damage. The center of the battlefield is getting very hot. 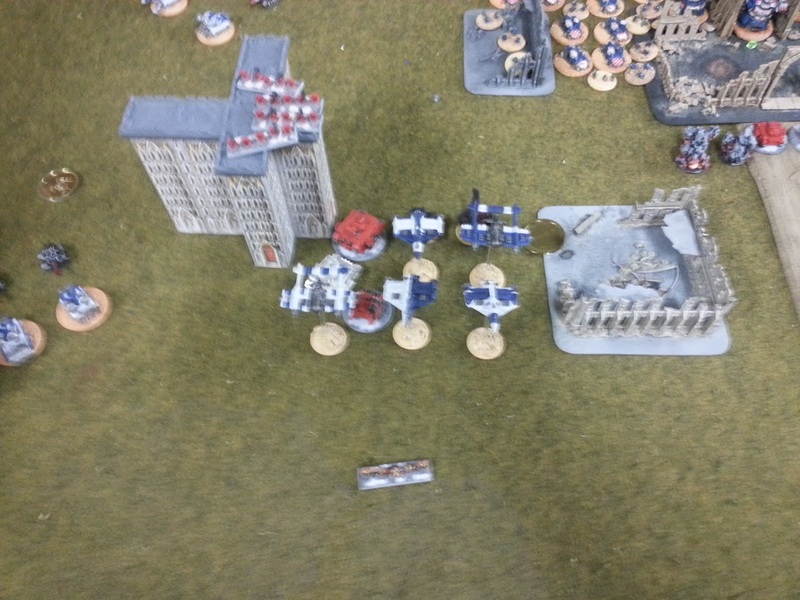 The Space Wolf whirlwinds open fire (on what, I forgot), but fail to damage. 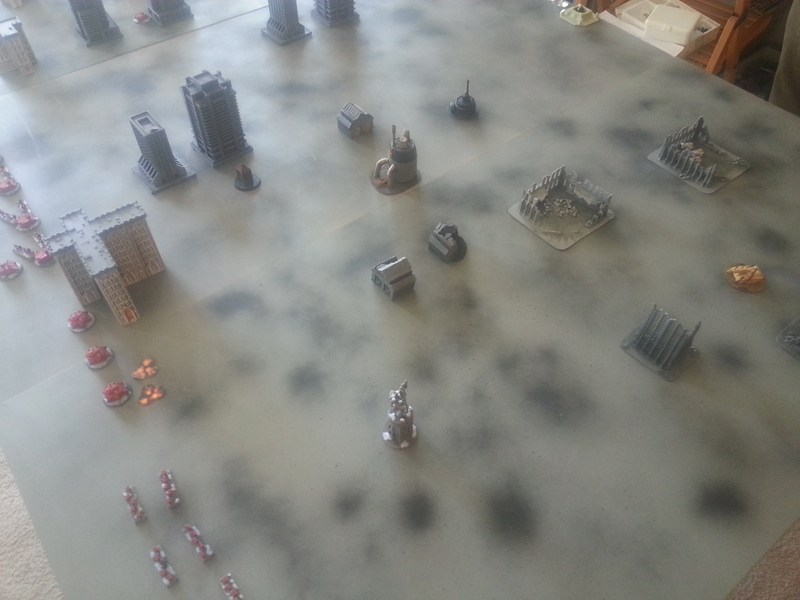 The Space Wolves are out of activations. 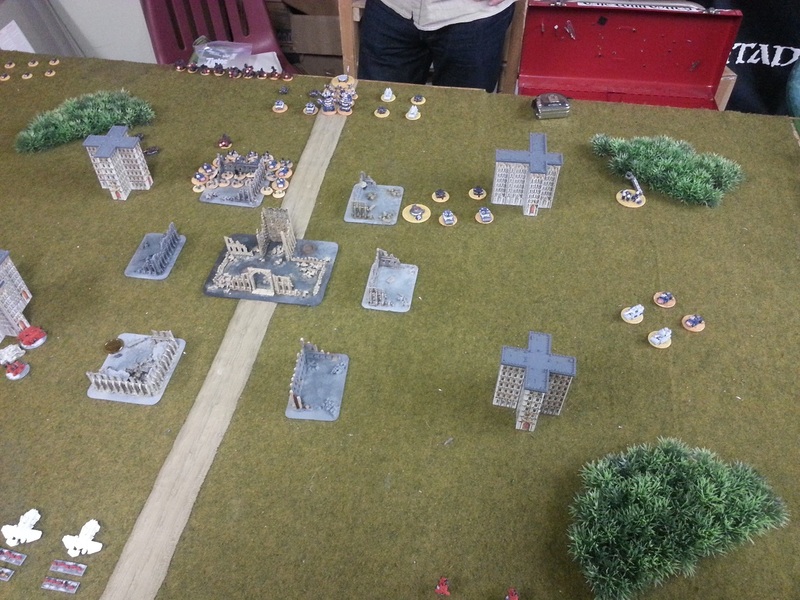 Two Assault formations and the Death Company double into assault positions with impunity. 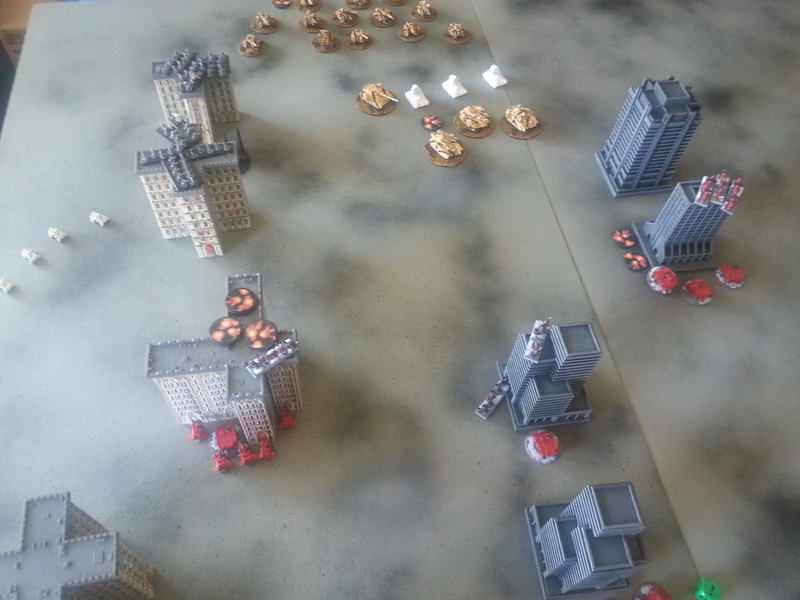 It’s a bold move – the Blood Angels are banking on winning the initiative roll for Turn 2. The assault is furious. 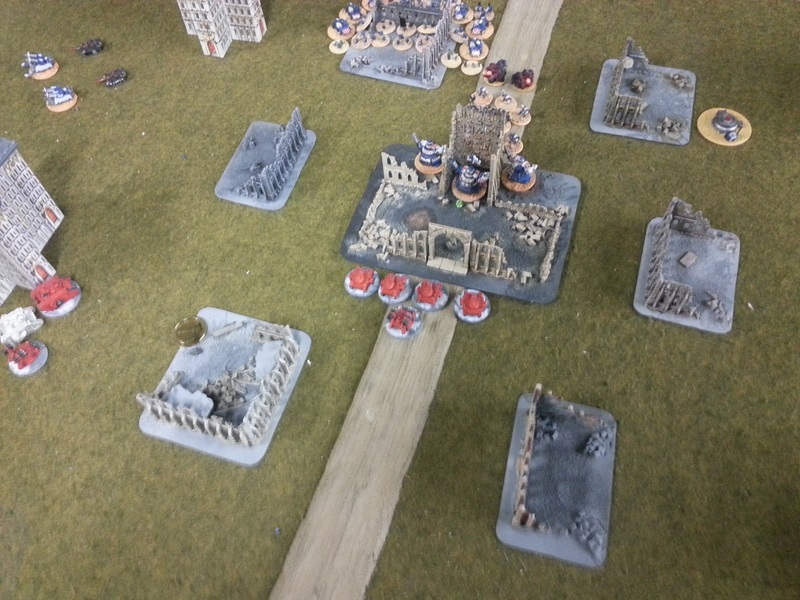 The Space Wolves wipe out five stands of Blood Angels and only lose one in return. 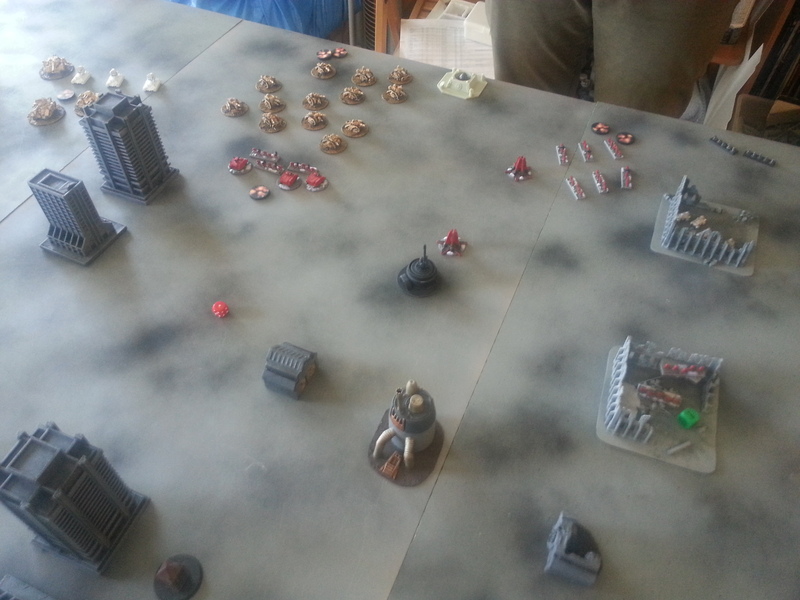 The broken Blood Angel formation was the one containing the Captain. 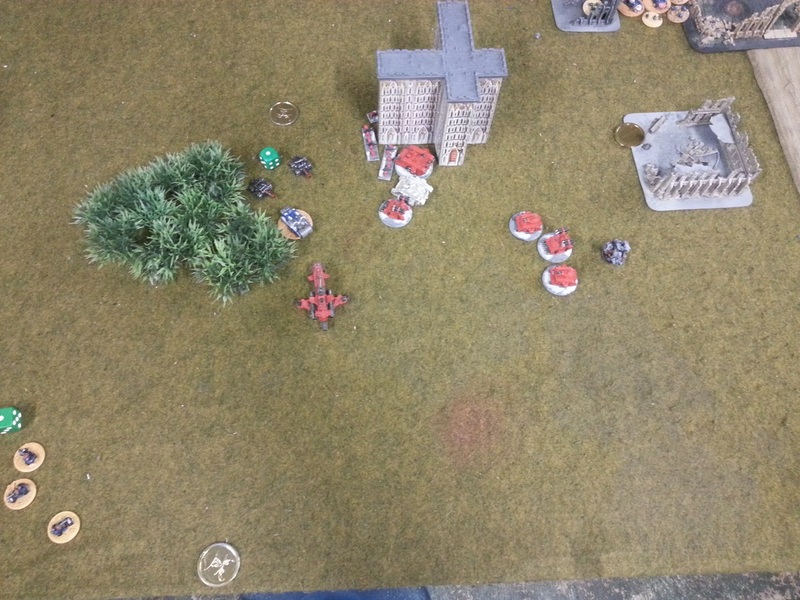 Blood Angel dreams of calling a combined assault are crushed then and there. 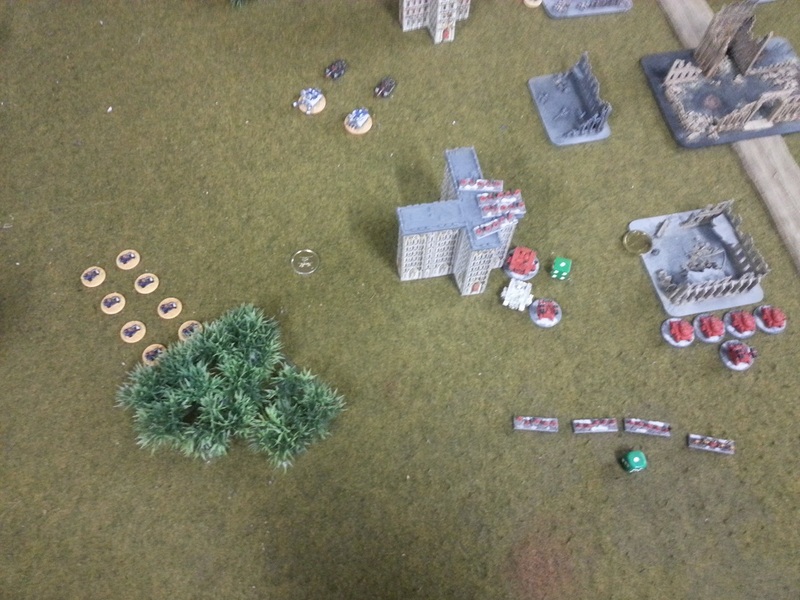 The Blood Angels commander is able to think clearly enough to prioritize his moves in spite of thirsting for vengeance, and sends the Land Speeders against the Reaver Titan, damaging some shields. 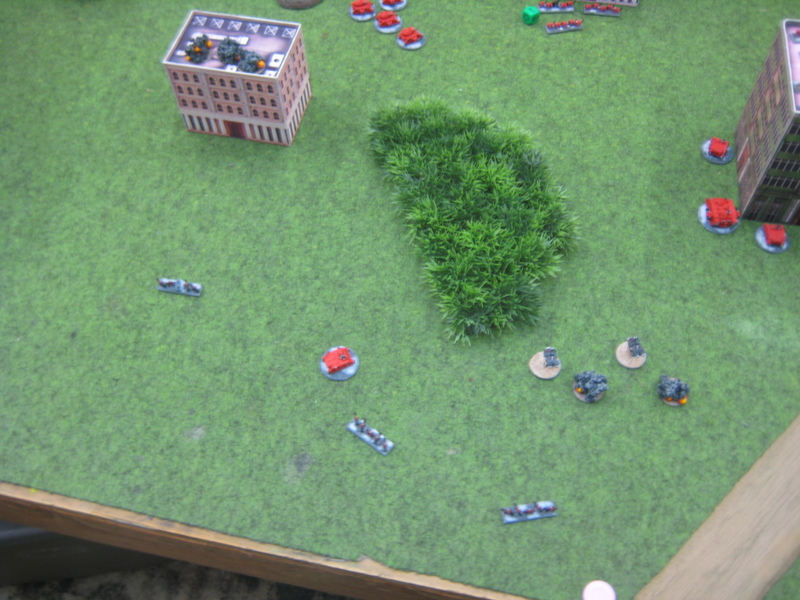 Devastators advance as well, and drop more shields. 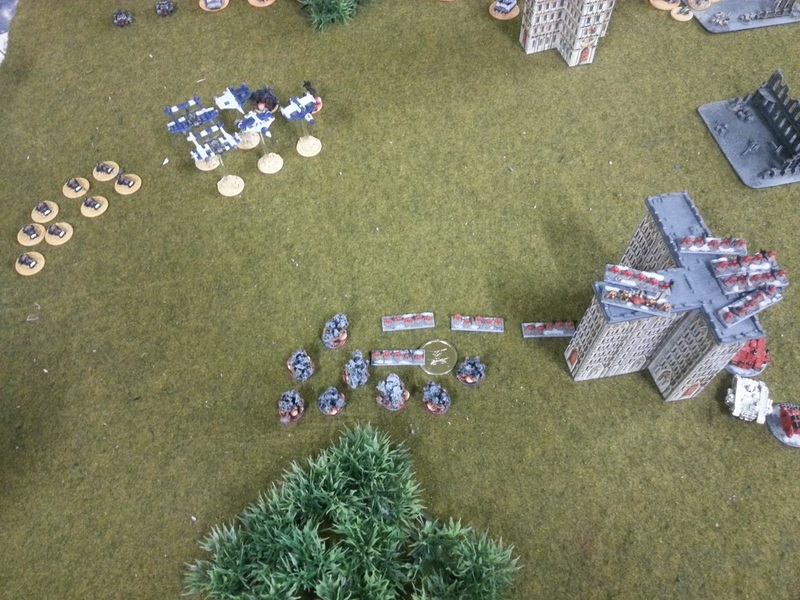 All Weapons are hot on the Space Wolf Command formation, but it proves surprisingly resilient. 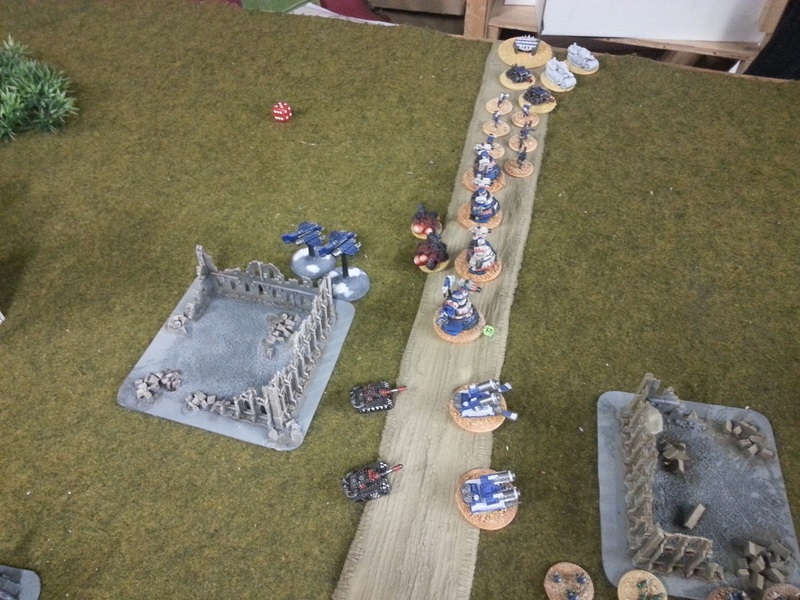 Space Wolf Land Speeders make a daring move behind enemy lines, shooting at a Blood Angel assault formation but failing to hit. 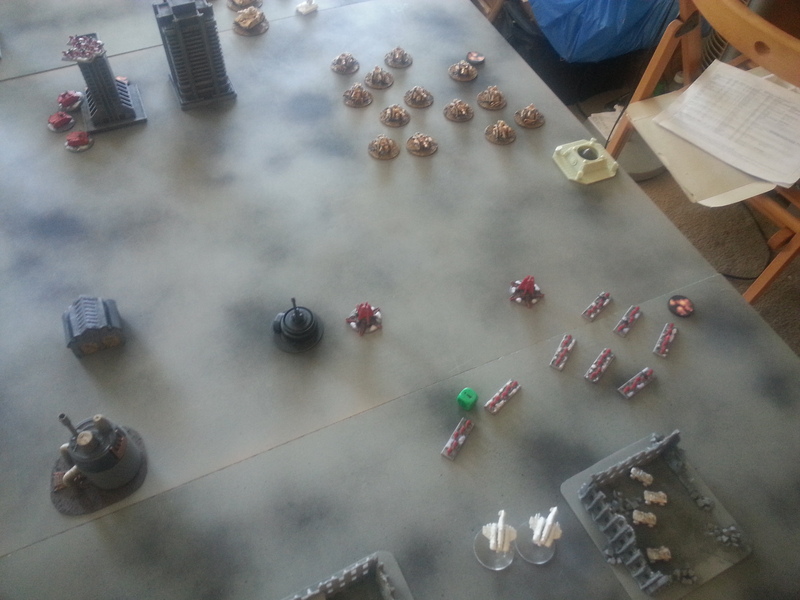 Space Wolf Predators declare a Titan supported assault against the Blood Angel Landspeeders and wipe them out. 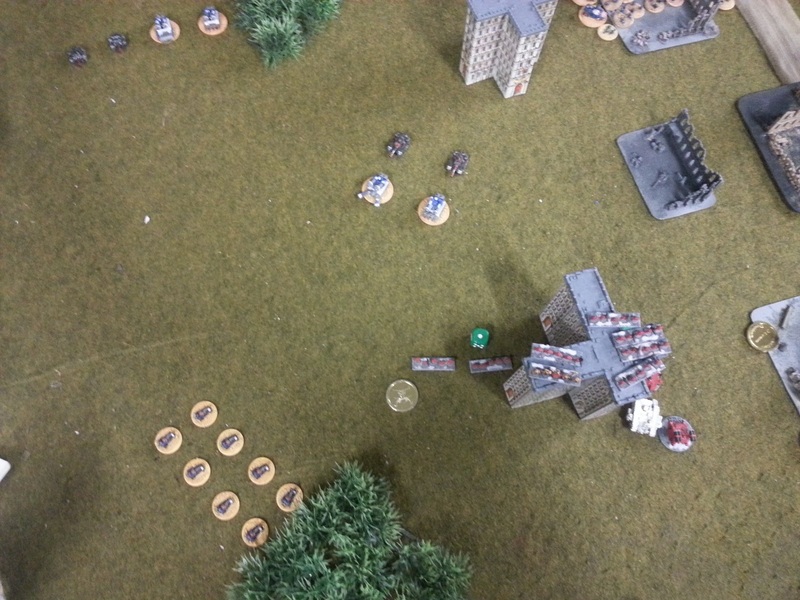 Baal Predators advance and open fire on the Space Wolves Command Company, causing heavy casualties and breaking the formation. 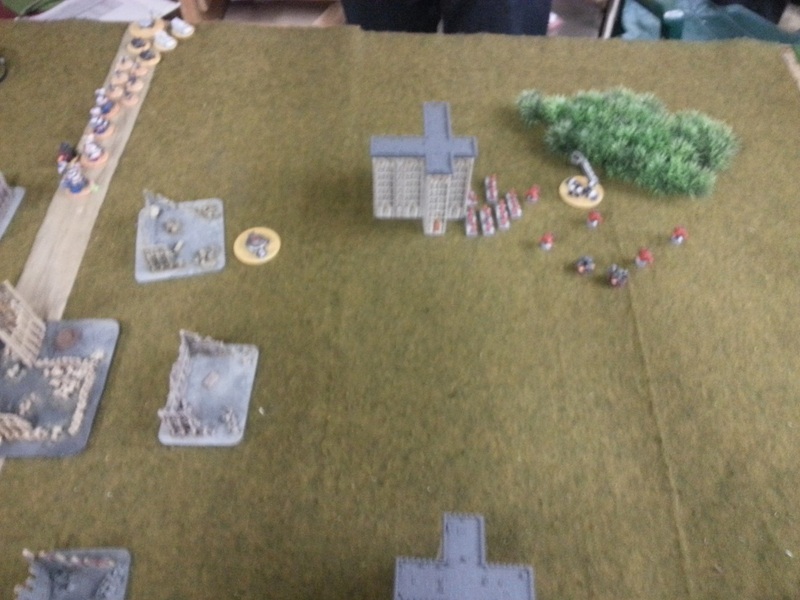 The Space Wolves flee. 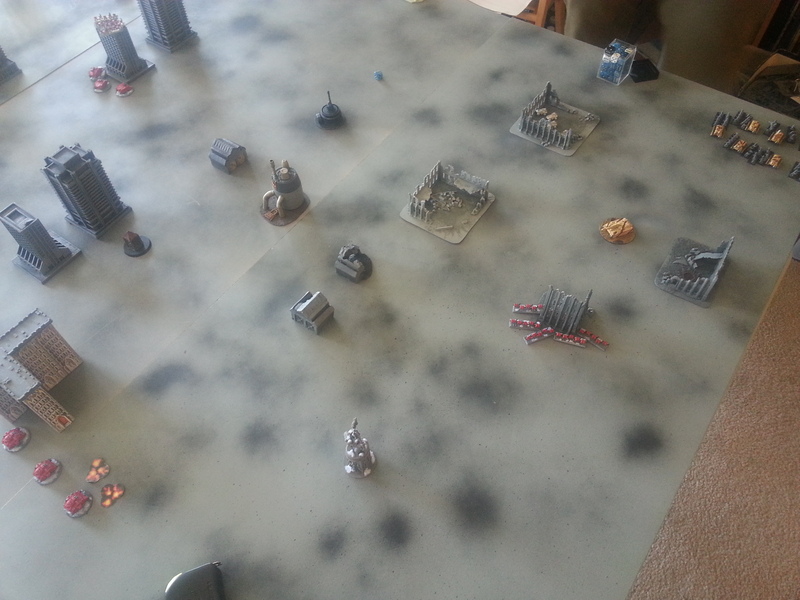 The Reaver retaliates, causing horrendous casualties and breaking the formation. 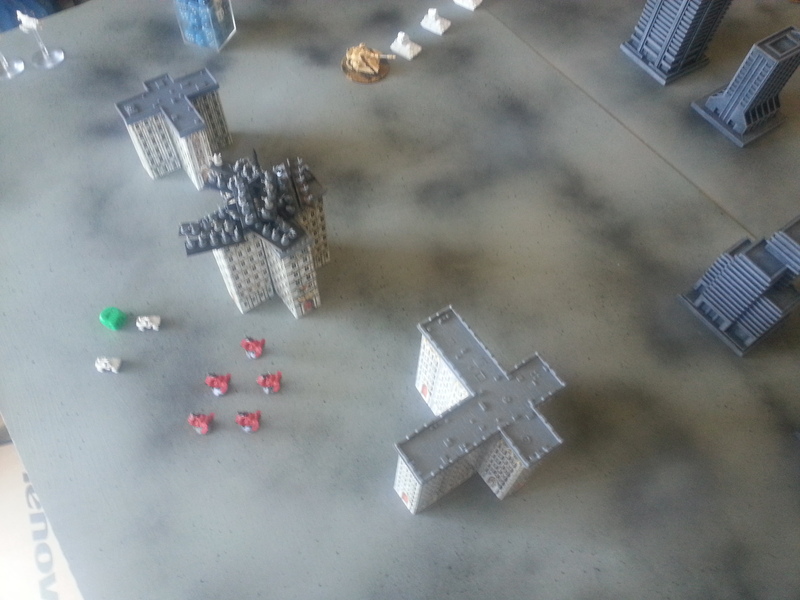 The Devastators flee. 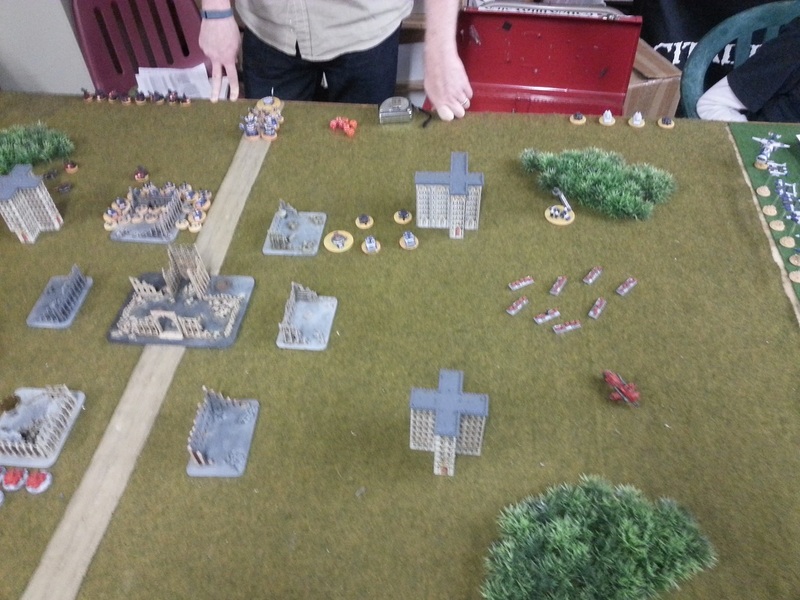 A six-strong Blood Angel assault formation led by a Chaplain assaults three Space Wolf Landspeeders and lose the assault! They are broken and flee. 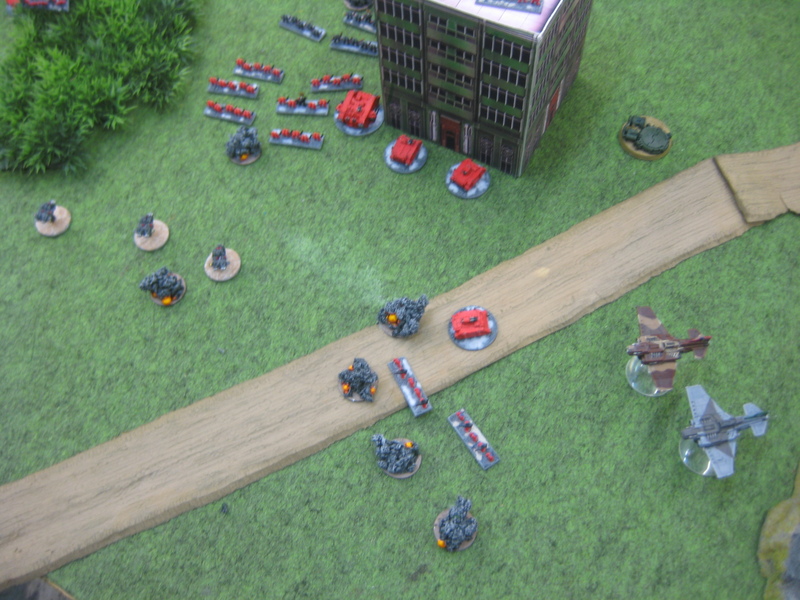 The Scouts looking to the skies to see the approaching Space Wolf Strike Cruiser, spread out to restrict the drop zone the best they can. 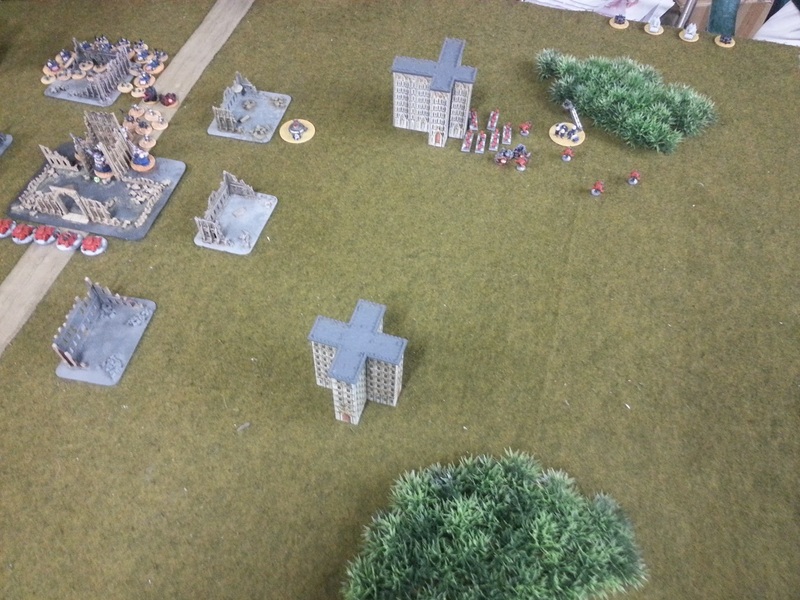 The Blood Angels win the initiative roll. 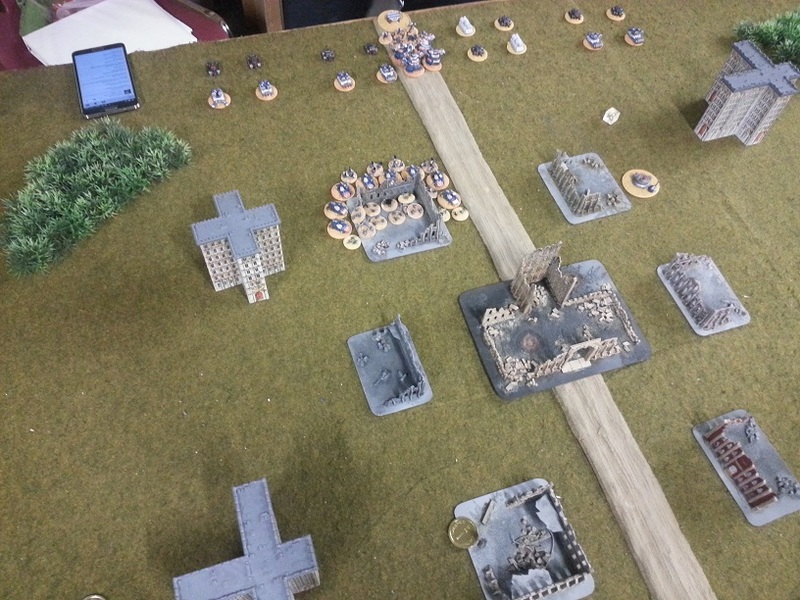 During the rally phase, the broken Space Wolves command formation fails to rally due to the presence of the Death Company. 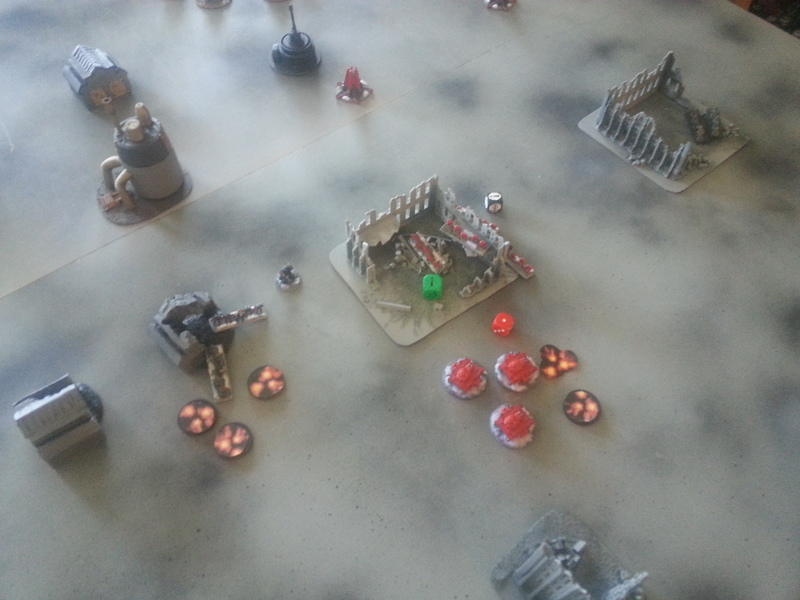 The Death Company charges the Space Wolf Whirlwinds, completely wiping them out. 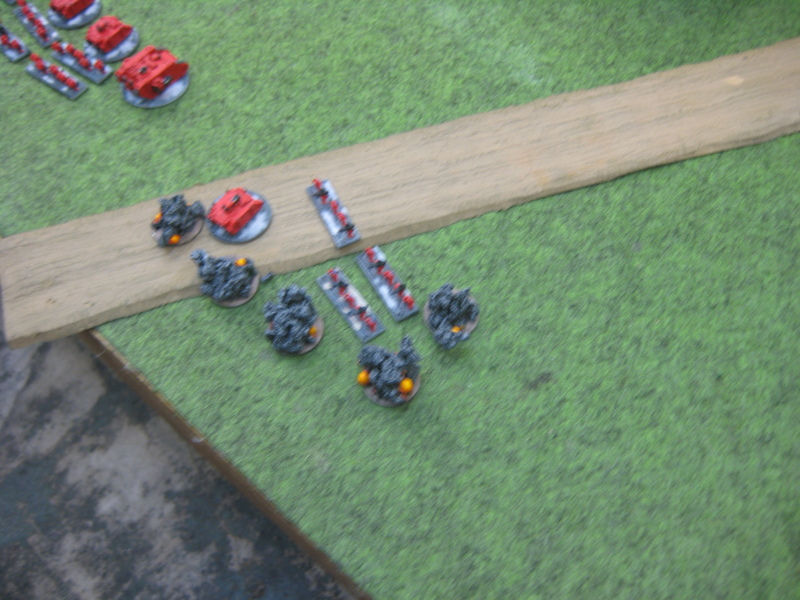 The Blood Angels retain and open fire on the Space Wolf Land Speeders behind their lines, wiping them out and destroying hopes of a last ditch objective grab. 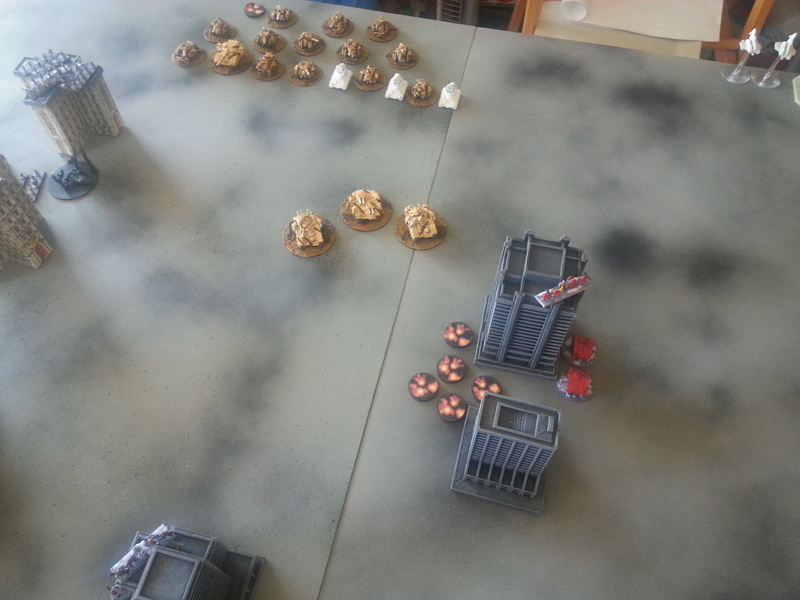 Space Wolf Predators fire ineffectively (not pictured), and Blood Angels scouts spread out over their Blitz objective to prevent the drop pod assault. 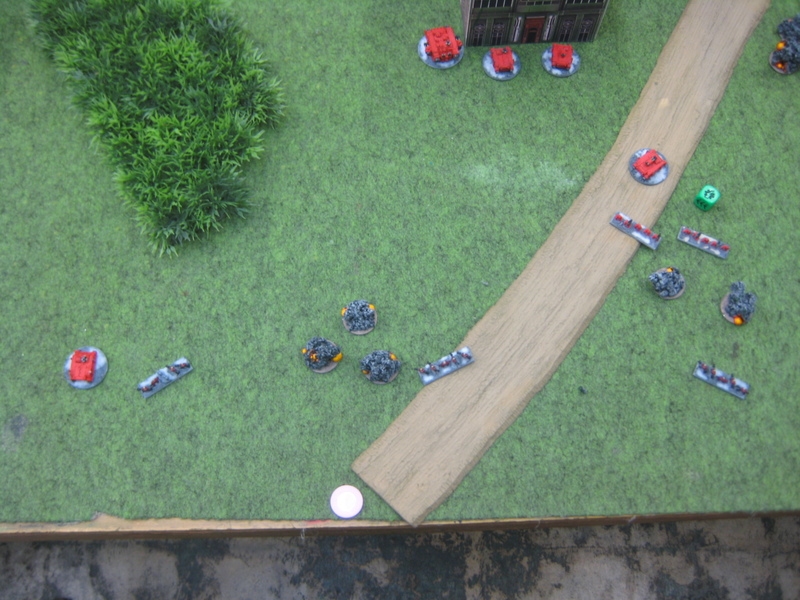 The Assault formation that lost the assault to the Land Speeders in the previous turn rally during the recovery phase, and double to sit on top of a Space Wolf objective. 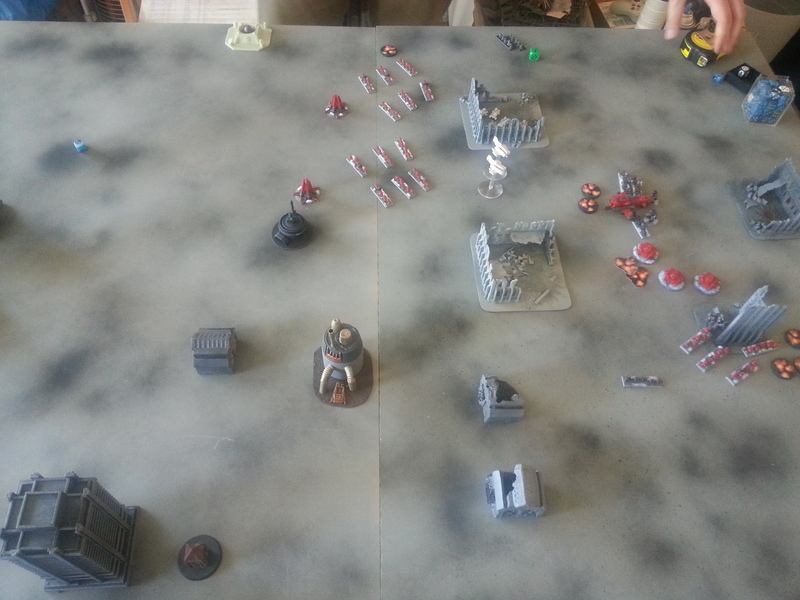 The Blood Angels now have Take and Hold, Blitz, and They Shall Not Pass. 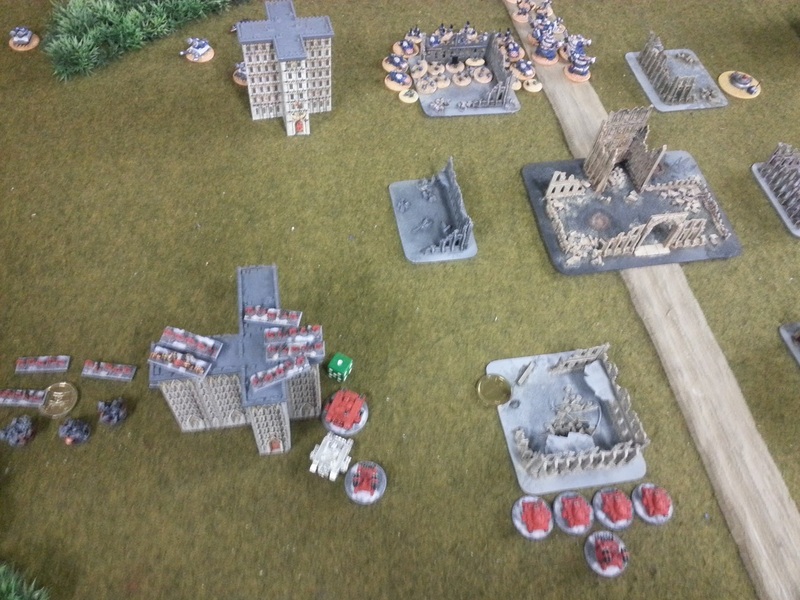 The Reaver TItan opens fire into the Blood Angel Command formation, doing tremendous damage. 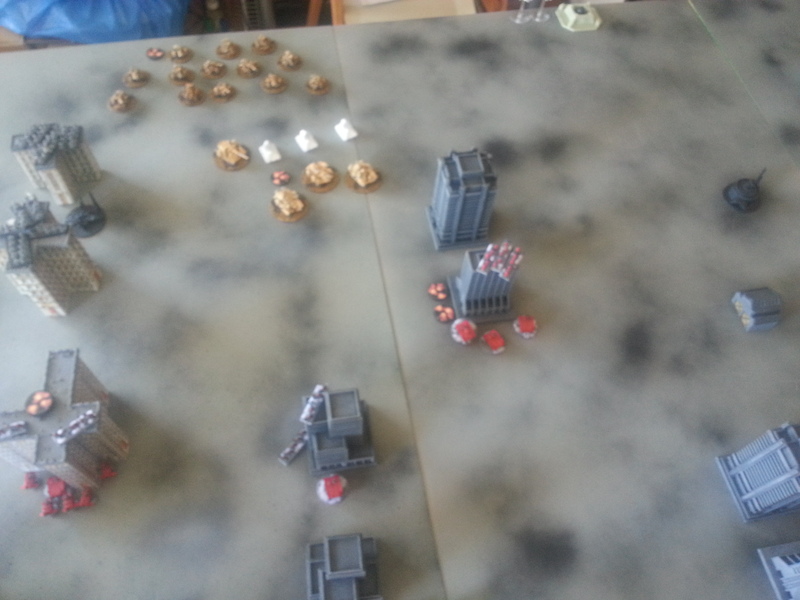 The other Blood Angel tactical formation advances to an objective and open fire on the Space Wolf Annihilators, failing to hit. 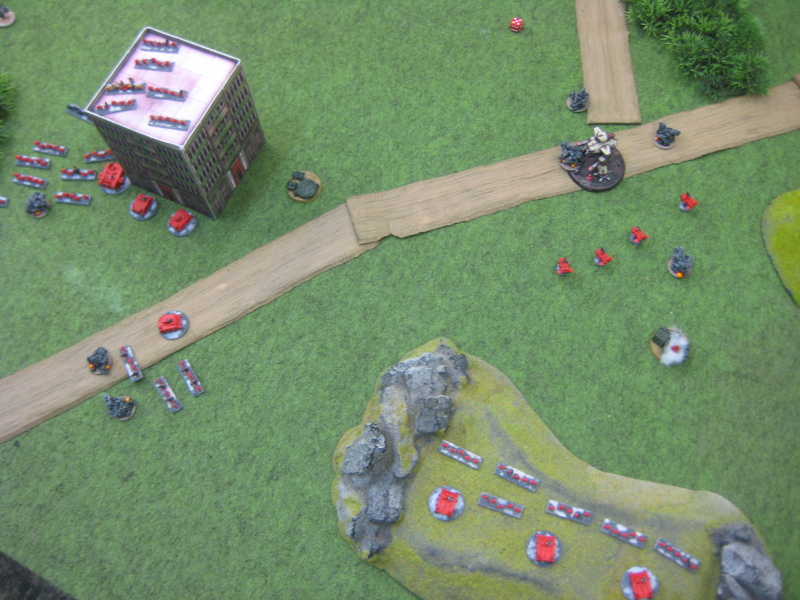 But the Blood Angels now have Take and Hold, Blitz, Defend the Flag, and They Shall Not Pass. 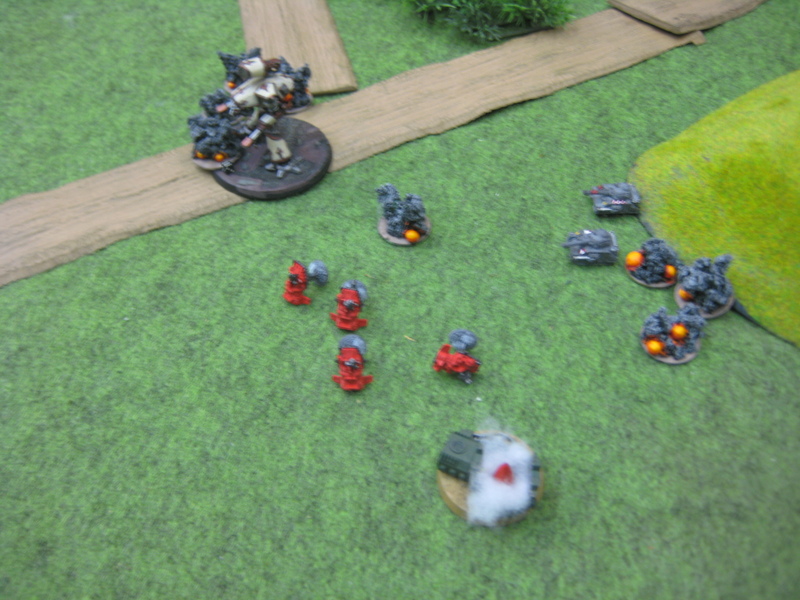 The Space Wolf Strike Cruiser activates, dropping its barrage on the Space Wolf Blitz objective occupied by the Baal Predators. Unfortunately, the blast does no damage. 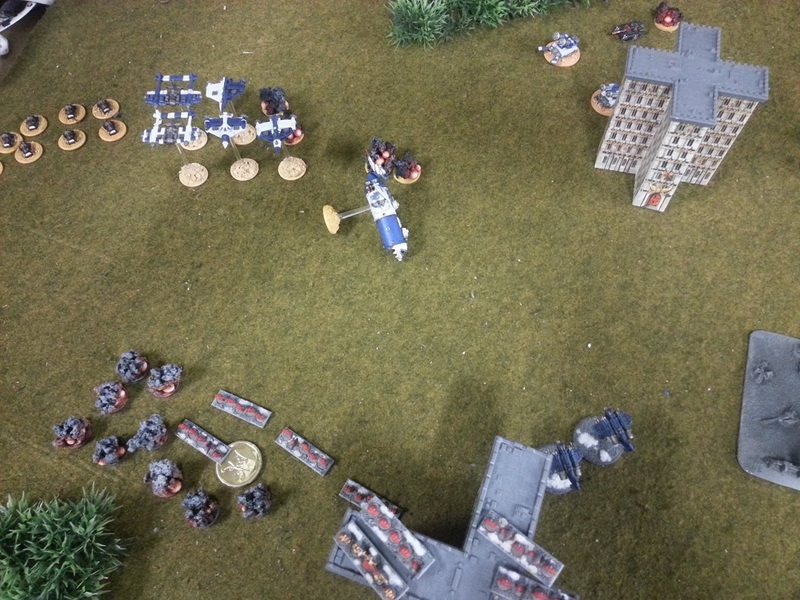 The Space Wolves rain from the skies in their Drop Pods and assault the Blood Angel Tactical formation, nearly wiping it out. But it is too little, too late. 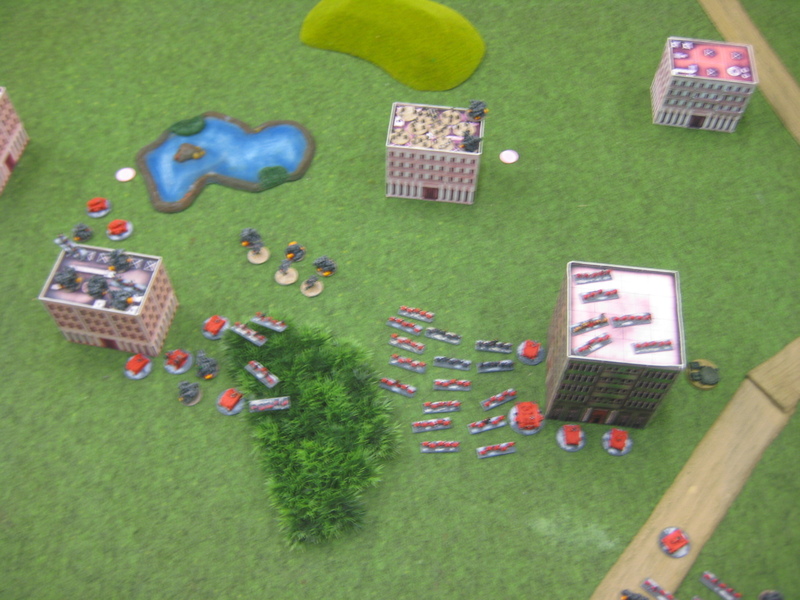 The Blood Angels have the Blitz and Take and Hold objectives, and the Space Wolves have no more activations with which to contest. 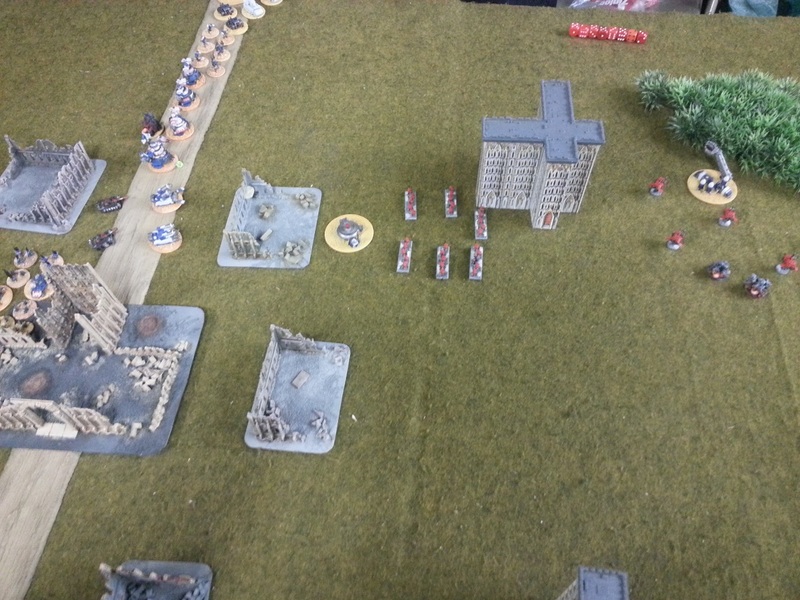 Blood Angels win 2 – 0. This was a bloody and hard fought battle. 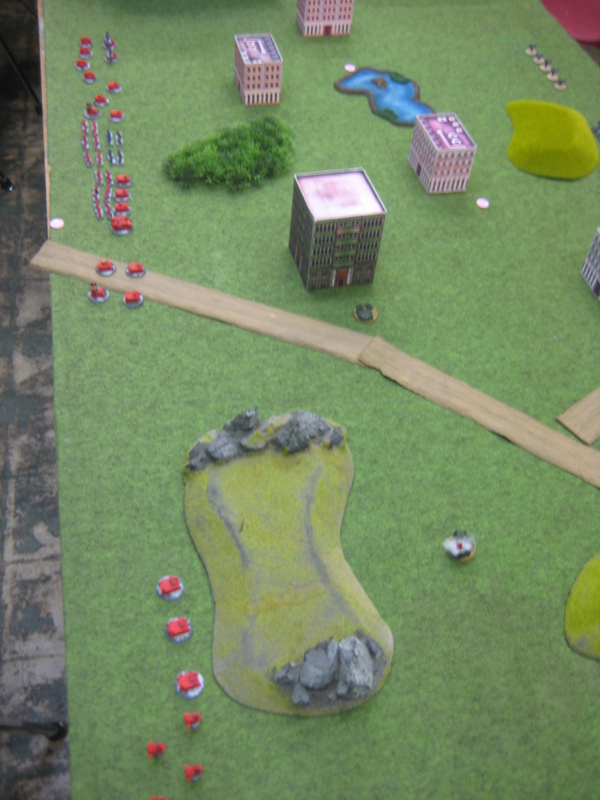 Writing this battle report, I realize it may have looked a little one-sided in turn three, but it really felt a lot closer than that. 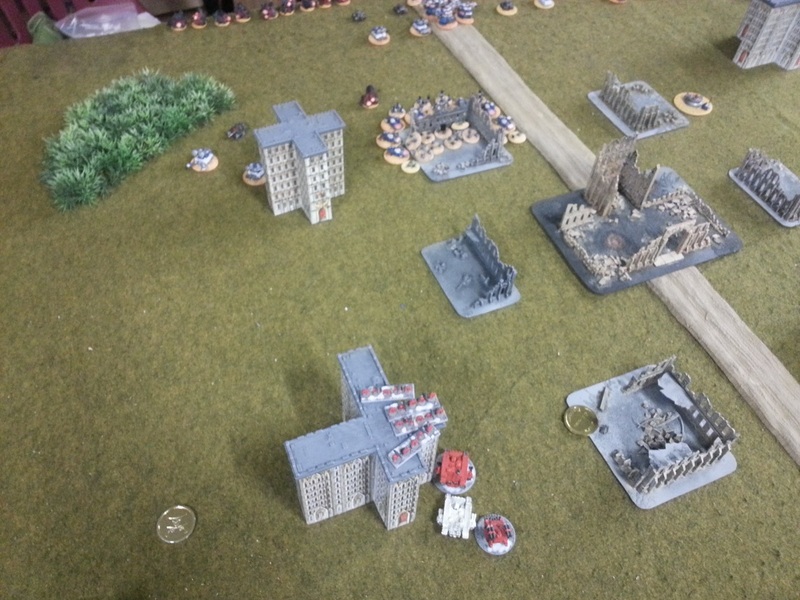 A couple of different moves, a couple different dice rolls in either direction, and it could have been a Space Wolf victory. 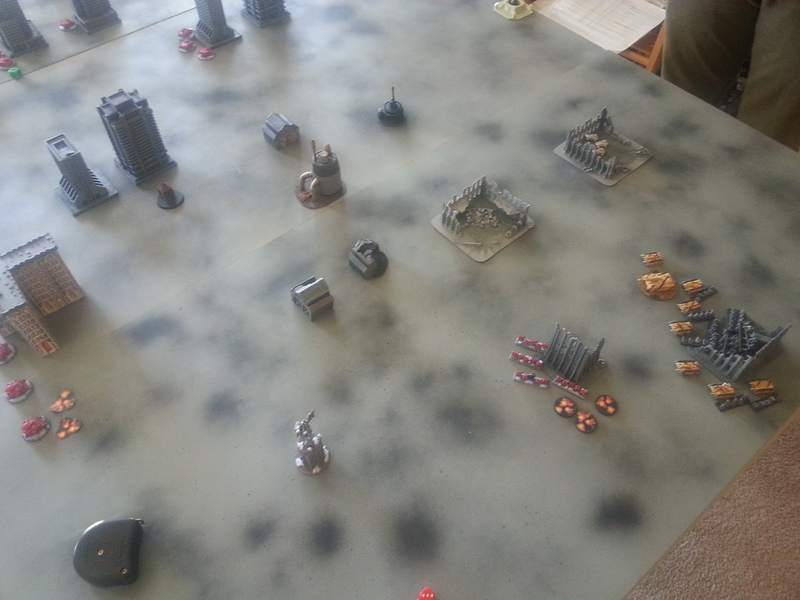 I think the Space Wolf player made a mistake in not sending the Reaver after the Baals on the Blitz in turn 3. Had the game gone on to turn 4, I am not sure I could have held on. 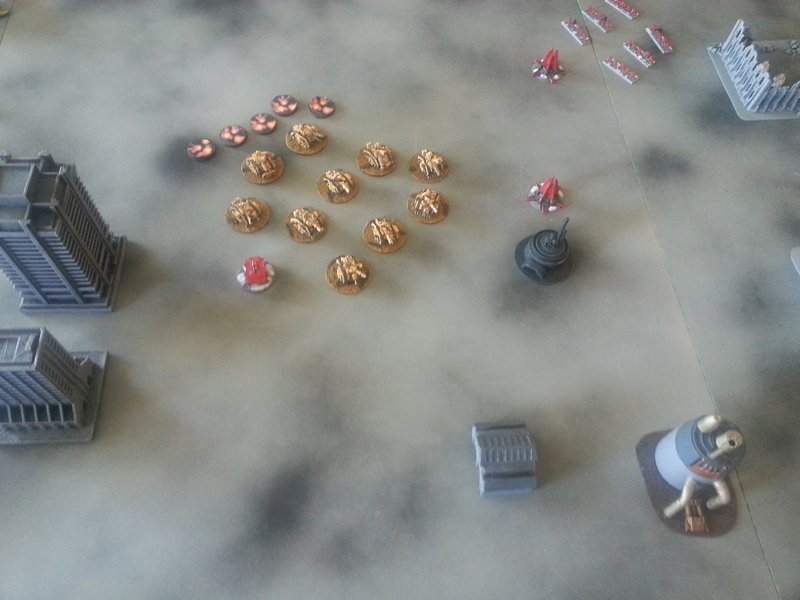 I really had no answer for the Reaver. 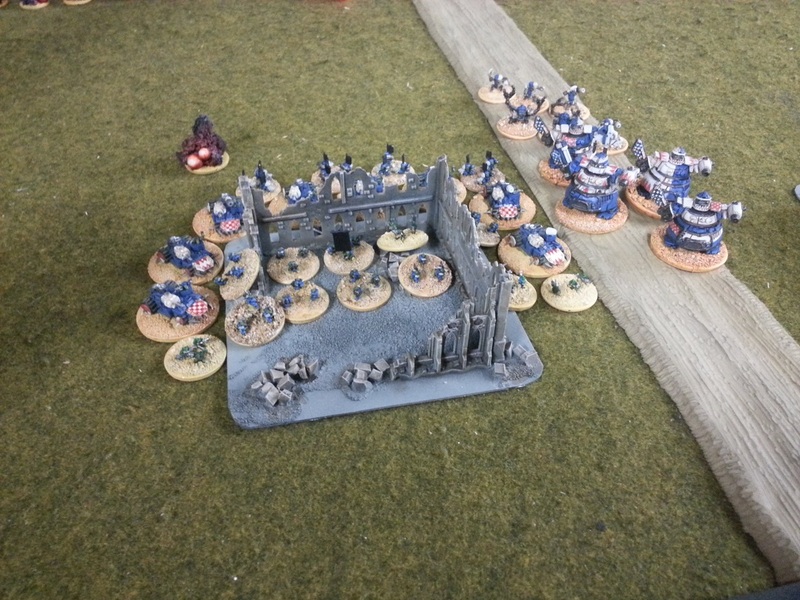 I looked at the Space Wolf list before going into the match, and it occurred to me that there is a lot of rope to hang yourself with in terms of taking big, expensive formations. I wanted to capitalize on this by keeping my activation count very high. This worked to my advantage throughout the course of the game. I considered taking some drop pods and Thunderhawks, but these were big investments that I could put towards more activations, so I made the decision to forgo them. 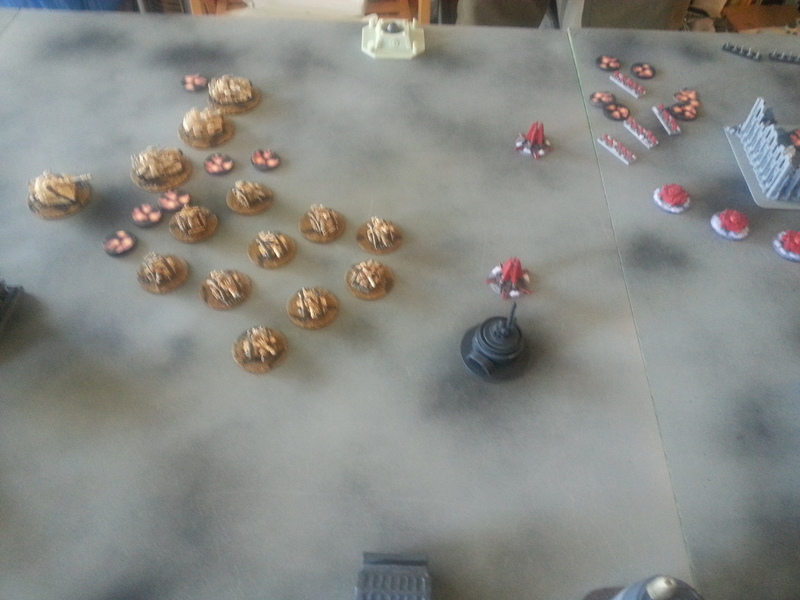 The Baal Predators performed much better than I anticipated. 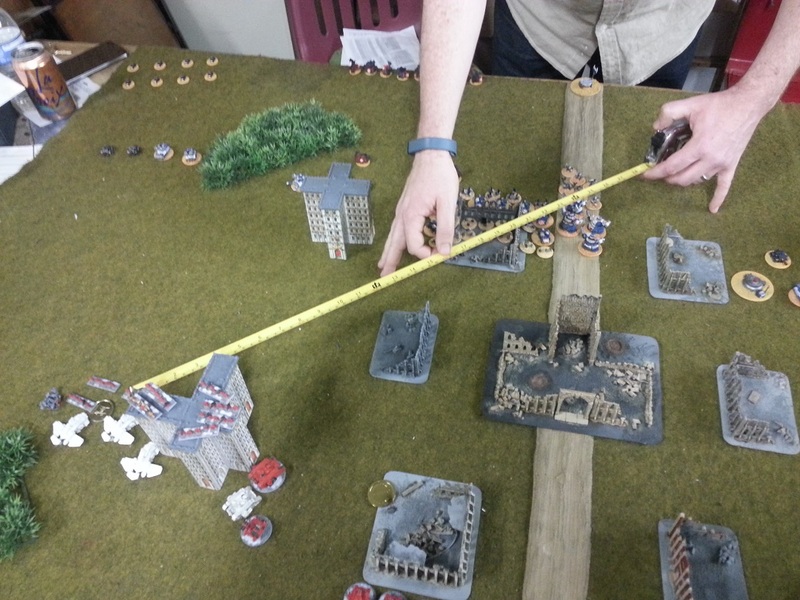 I felt that 300 points might be pricey for them, but for the amount of devastation that they lay down at close range, it seems fair. Don’t get within 15cm of those things. 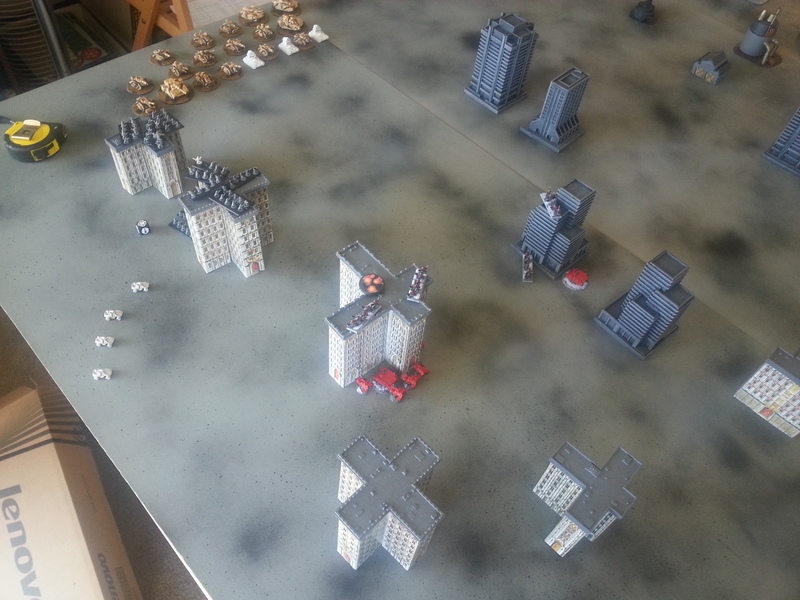 Super fun game, and thanks to my opponent for putting up a hard fight. 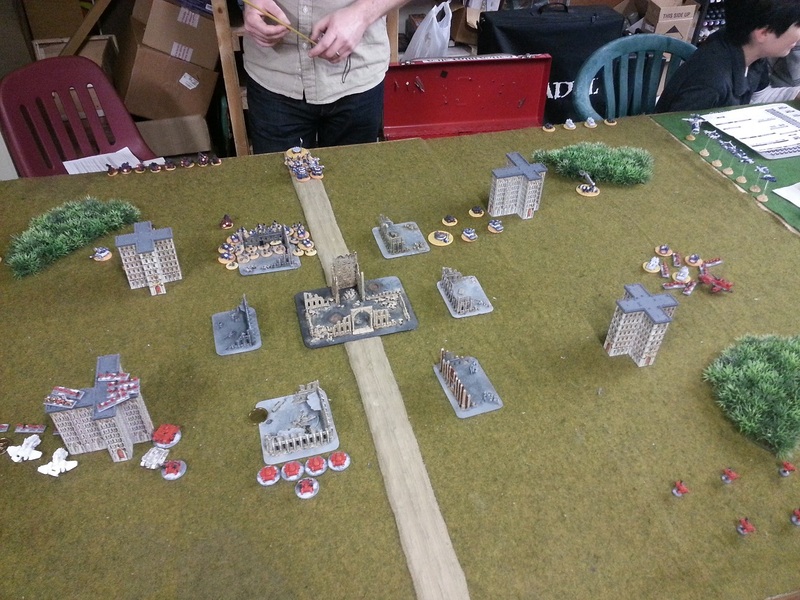 This entry was posted in Epic Armageddon and tagged Epic, Epic 40k, Epic Armageddon, Warhammer 40k on February 13, 2014 by xenocidalmaniac.